Weekly Analysis: Last week belonged to the bears, with the last 2 days being the most active. Euro weakness was mainly generated by the ECB Meeting and Draghi’s press conference. The June low created by the Brexit vote was taken out last Friday and it looks like the pair’s next destination is the key support zone around 1.0800. The Relative Strength Index is just entering oversold and the Stochastic is already there so we expect a bullish retracement to come when the 1.0800 mark is touched or even sooner. 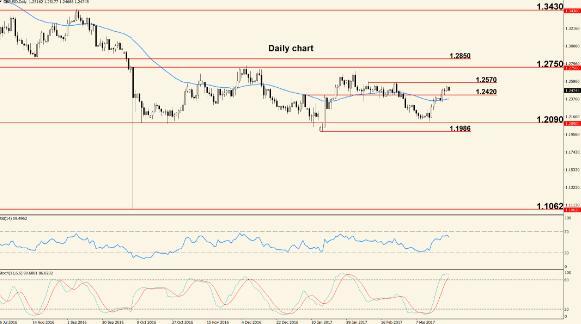 The previous support levels (1.0955 and 1.0910) may turn into resistance and reject a possible move up; if these levels become resistance, the chances of a move into 1.0800 will increase. The first day of the week ahead is focused on Eurozone Manufacturing and Services PMI but these are medium impact indicators so we don’t expect strong movement. Action picks up Tuesday with the release of the German IFO Business Climate, a well respected survey due to its large sample of about 7,000 businesses. On the US Dollar side we have the Consumer Confidence, another survey focused on the opinions of respondents regarding overall economic conditions. The next major release comes Thursday in the form of the U.S. Durable Goods Orders, followed the same day by the U.S. Pending Home Sales and the week ends Friday with the release of the German Consumer Price Index and the Advance version of the U.S. GDP. The last two events of the week may have the strongest impact because one measures inflation and the other is the main gauge of an economy’s performance, both key elements for a currency’s strength. The Pound moved in a range last week, with some strength generated by better than expected inflation data; however, most of the gains were erased later in the week. 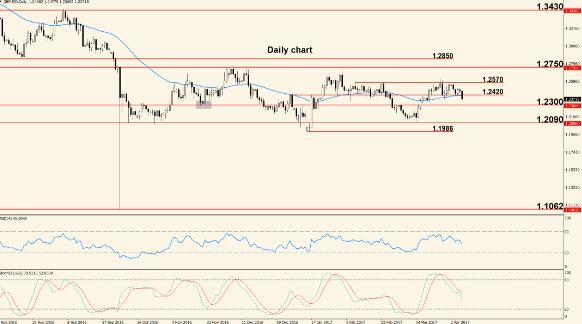 The pair is under bearish pressure and we expect to see a move closer to 1.2090 this week. It must be noted that the Relative Strength Index is still in oversold territory and the bears had difficulties breaking 1.2090 in the past. This may push price higher once (and if) the mentioned support is touched again but the pair is in a downtrend so our overall bias is bearish. Tuesday the Pound is likely to show increased volatility and irregular movement because Bank of England Governor Mark Carney will testify on the consequences of the Brexit vote before the House of Lords Economic Affairs Committee. We recommend extreme caution at the time. The other important event of the week is the release of the British Gross Domestic Product, scheduled Thursday. Although we only have 2 major events for the Pound this week, both of them have the potential to generate strong movement; as always, the U.S. releases will directly impact the pair’s direction. 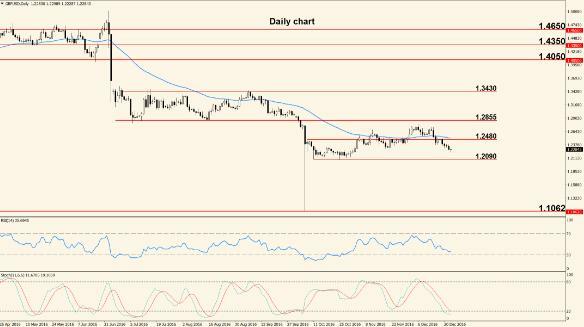 Weekly Analysis: The US Dollar weakened last week, with Friday being the most active day. The decline was generated by FBI’s decision to reopen Clinton’s email case; depending on new developments on that matter, we may see further greenback weakness. Price bounced at 1.0850 and moved past 1.0955, with the Relative Strength Index and Stochastic exiting oversold, going up. We expect the push up to extend into the 50 period Exponential Moving Average but the pair is still in a downtrend (although fragile) so it’s very likely to see a bearish move when that zone is reached. A break of the 50 EMA will make 1.1150 the first bullish target. The week ahead starts Monday with the release of the German Retail Sales and Eurozone Estimate Consumer Price Index but these are likely to generate just a medium impact on the Euro. Tuesday French and Italian banks are closed in observance of All Saints Day, so we expect low volatility coming from the Euro’s side and on the U.S. side the Manufacturing PMI is the only notable release. Wednesday is a huge day for the US Dollar because the Fed will announce the interest rate and will release a FOMC Statement that will explain some of the reasons that determined the rate decision. No change is expected yet, but the event usually generates strong movement. The final major release of the week is scheduled Friday in the form of the U.S. Non-Farm Employment Change, a report that is widely considered the most important jobs data in the United States. Since this week we have the rate announcement and the NFP (usually these are not released the same week), we expect strong movement on all US Dollar pairs. The pair moved sideways for almost the entire last week and all directional impulses were quickly reversed. The Pound benefited from a better than expected GDP value but this strengthened it just momentarily. 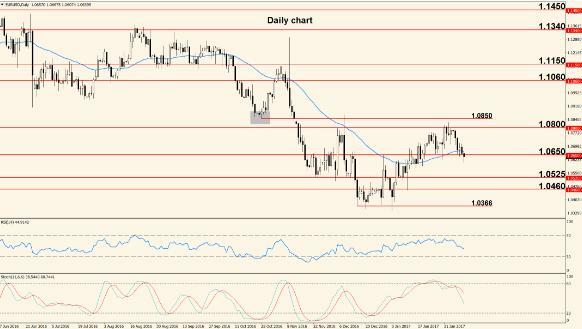 The bears tried twice last week to break the support at 1.2090 but failed and price stalled. If the pair moves into this support for a third time, it will either break it or it will shoot up. If 1.2090 is broken, we don’t have any immediate support below it, while to the upside we have minor resistance at 1.2325. This level will be the first bullish target if 1.2090 holds. Our bias is neutral, anticipating a strong breakout. The first major release of the week is the Manufacturing PMI, scheduled Tuesday, followed Wednesday by the Construction PMI and Thursday by the Services PMI. These are leading indicators of economic health, focused on business conditions and derived from the opinions of purchasing managers from the respective sector. The impact is often mild but usually, higher numbers strengthen the Pound. Thursday the Bank of England will also release their Inflation Report, containing inflation and economic expectations for the next 2 years and the same day the interest rate is made public, as well as a Monetary Policy Summary that offers insights into the reasons that determined the rate vote. As always, the U.S. events released throughout the week will have a direct and potentially strong impact on the pair. Weekly Analysis: The pair completed a bullish week and moved above the 50 days Exponential Moving Average. The Fed maintained the interest rate unchanged and the NFP report somewhat disappointed, contributing to the strong move up. Price is now trading above the 50 days EMA, placing the pair in a bullish environment from a short to medium term perspective. However, a clear trend is not in place, the oscillators are approaching overbought and the resistance at 1.1150 sits in front of rising price; all this may suggest that we will see a bounce lower once 1.1150 is touched. If this occurs, price will likely retrace to the 50 EMA but a clean break of 1.1150 will make 1.1250 the first potential target. The week ahead starts Monday with the Eurogroup Meetings and continues Tuesday with the ECOFIN Meetings. However, the more important event is the U.S. Presidential Election that also takes place Tuesday and will probably overshadow the Meetings. The US Dollar may react strongly to the result of the election so we recommend caution throughout the day. Wednesday and Thursday have a lackluster economic calendar, while Friday’s only notable release is the University of Michigan Consumer Sentiment, a survey that tries to gauge the confidence of consumers in overall economic conditions. As you can see, we have a slow week ahead, but this doesn’t mean that price movement will be slow, especially considering the huge event that is the U.S. Presidential Election. The Pound won last week’s race against the US Dollar and we saw a move outside the horizontal channel. This week’s price action will probably reveal if the break is true or just a fake move above resistance. The pair moved above 1.2480, which represents the upper part of the horizontal channel but now it’s sitting right on the 50 days Exponential Moving Average. The break of 1.2480 is not yet clear (the level was not re-tested after the move above it) and the moving average is likely to offer resistance so we may very well see a bounce lower. If price moves above the 50 days EMA, the chances of a move into 1.2800 zone will increase, while a move back inside the channel would mean that the ranging period is still not over. The busiest day of the week for the Pound will be Tuesday when the Manufacturing Production numbers come out, as well as an estimate of the British Gross Domestic Product, provided by the National Institute of Economic and Social Research (NIESR). The first indicator tracks changes in the total value of products generated by the manufacturing sector, and the Gross Domestic Product is an economy’s main gauge of performance, so higher numbers usually bring a stronger currency (however, keep in mind this is only an estimate). The U.S. Election will have a direct and probably strong impact on the pair’s direction. Weekly Analysis: Election week is over and United States has a new President. 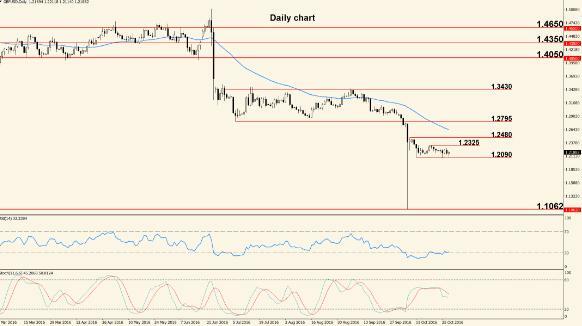 The US Dollar received the news well, strengthening against most of its counterparts and as a result we saw the pair drop through several support levels. 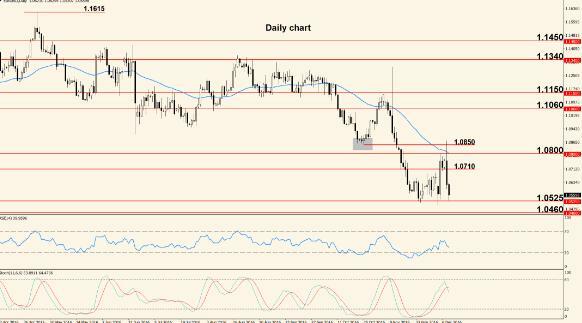 After a big spike that took price into 1.1300 territory, the pair reversed as the US Dollar was fueled by the Presidential Election, dropping through multiple barriers until finally stopping near 1.0850. Early this week we will see if the pair stopped because the markets closed on Friday or because price is exhausted. The distance traveled was more than 450 pips and this calls for a retracement to the upside; this potential pullback has increased chances of happening after 1.0800 support is hit but 1.0850 is not clearly broken. If the US Dollar doesn’t break its current support (1.0850), we may see a bounce that will take price closer to 1.0950 zone. ECB President Mario Draghi opens the week with a speech delivered Monday in Rome. As usual, caution should be used during his speeches because the Euro may have a strong reaction. Tuesday we take a first look at German Gross Domestic Product with the release of the Preliminary version of this indicator and on the US Dollar side we have the always important Retail Sales. This type of sales represents the biggest chunk of consumer spending, which in turn accounts for the main part of overall economic activity, thus higher readings for the retail sales usually strengthen the greenback. 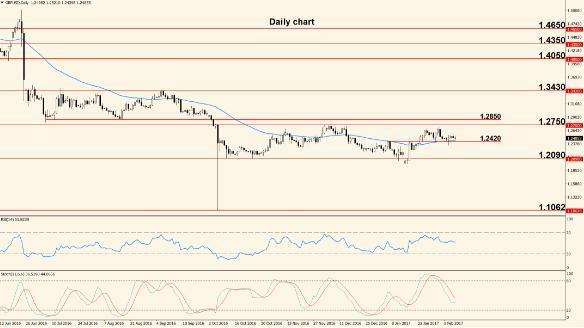 Wednesday the spotlight remains on the US Dollar with the release of the Producer Price Index, an indicator that tracks changes in the price charged by producers for their goods. It has inflationary implications because if the producer charges more, the client will eventually pay a higher price. Currently, higher numbers are beneficial because inflation is considered too low. Thursday we take a look at U.S. inflation with the release of the Consumer Price Index and Fed Chair Yellen will testify before the Joint Economic Committee; the topic is economic outlook so we expect high volatility during and after the event. The week finishes Friday with another speech delivered by the ECB President, this time at the Euro Finance Week, in Frankfurt. The US Dollar couldn’t win the battle against the Pound last week and instead we saw a move above resistance. We have an important week ahead because we will find out if the strength showed by the greenback against other currencies will also extend to this pair. The previous resistance at 1.2480 is now clearly broken but the 50 days Exponential Moving Average may still reject price lower even if last week closed above it. The candle that moved above the EMA shows signs of rejection and the break is not decisive. It looks like bearish pressure is mounting, so if price returns below the Moving Average early this week, we expect it to drop below 1.2480 but if the Pound continues to strengthen, we will most likely see a move into 1.2800 zone. The first major release of the week is the British Consumer Price Index, scheduled Tuesday and followed half an hour later by the Inflation Report Hearings, during which BoE Governor Carney will testify on economic outlook and inflation before the Treasury Committee of the Parliament. Both these events usually have a high impact on the Pound so we can expect increased volatility. Wednesday the Claimant Count Change will offer insights into the British unemployment situation and the final event of the week is the release of United Kingdom’s Retail Sales numbers, scheduled Thursday. As always, the U.S. events will have a direct and possibly strong impact on the pair’s direction. For the entire last week the US Dollar dominated and the pair dropped below 1.0600. Since the U.S. Presidential Election result was known, the pair didn’t have any bullish days and the sellers remained in total control. The huge drop that started with the U.S. Presidential Election will probably continue in the long term but for the time being, the pair is oversold as indicated by the Relative Strength Index and the Stochastic. This means that a retracement has increased chances of occurring and it will be signaled by the oscillators exiting oversold territory. The first possible resistance is located at 1.0710 but the level was last touched a long time ago so a more important level may be 1.0850 because this is the latest level where price showed a strong reaction. 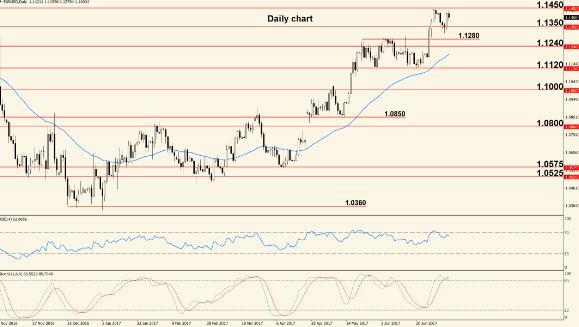 To the downside, 1.0525 is the first support. The first major event of the week is scheduled Monday: the testimony of ECB President Mario Draghi before the European Parliament, In Strasbourg. The topic is the European Central Bank's Annual Report and the financial markets are likely to be influenced by Draghi’s attitude. Tuesday we have a thin economic calendar, with the U.S. Existing Home Sales being the only notable release. The indicator offers insights into the U.S. housing market, with higher numbers being beneficial for the US Dollar. Wednesday the FOMC will release the Minutes of their latest Meeting; this document offers insights into the reasons that determined the latest rate decision but can also reveal hints about a possible December rate hike. If this is the case, the US Dollar will be strongly affected. Thursday U.S. banks will be closed, celebrating Thanksgiving Day and no indicators will be released. The holiday will probably affect volatility so it’s very likely to have a choppy trading session. On the Euro side the only notable release is the German IFO Business Climate, a survey of about 7,000 businesses, focused on economic conditions and expectations for the next 6 months. The week ends with a slow day, without major economic releases. British economic data released last week was mixed, with disappointing inflation numbers but better than expected Retail Sales. However, the pair didn’t seem affected much by the economic numbers and the sellers moved price lower. After a failed attempt to break the 50 period Exponential Moving Average to the upside, the pair reversed and moved below 1.2480. This makes 1.2090 the first notable support and puts short term control in the hands of the bears. As long as the pair is trading below the 50 EMA and below 1.2480, we favor the short side, aiming for 1.2090, but a move above the mentioned resistance zone would invalidate such a scenario. The Pound has a lackluster week ahead, with only a few notable indicators: Tuesday the Public Sector Net Borrowing numbers are released, showing the difference between spending and income for government and public corporations. Friday the Second Estimate version of the British Gross Domestic Product is released, but although the GDP is considered a high impact indicator, this version is less important than the Preliminary, which was already released. Nonetheless, higher values show a stronger economy and possibly a stronger currency. 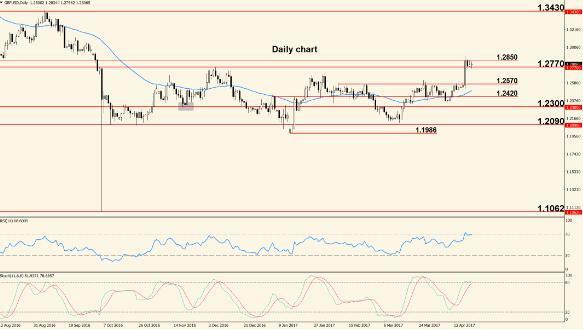 WEEKLY ANALYSIS: BUCKLE UP, IT’S NFP WEEK AGAIN! Weekly Analysis: During last week the pair reached the support at 1.0525, with the most active day being Wednesday when the FOMC Minutes hinted that a rate hike may come relatively soon. Support is still holding but control belongs to the bears. 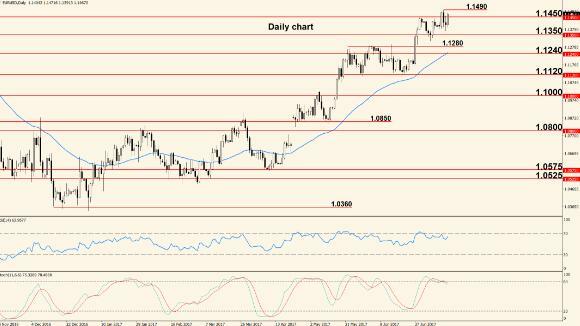 The pair has reached a very important support at 1.0525, with the Relative Strength Index and Stochastic both in oversold territory. Also, price traveled a long distance without a proper retracement and all this may indicate that a bullish pullback is needed before bearish movement can resume. We must keep in mind that the pair is in a downtrend so we cannot exclude the possibility of a quick break of 1.0525; if this is the case, the next barrier and target will be 1.0462, which is the lowest point reached since 2015. The week opens Monday with an important testimony delivered by ECB President Draghi before the European Parliament's Economic Committee, on the topic of Brexit consequences and economic outlook from ECB’s perspective. High volatility may be experienced during the event, thus caution should be used. Tuesday we have two important U.S. releases: the first is the Preliminary version of the Gross Domestic Product, followed by the Consumer Confidence survey. The GDP is an economy’s main gauge of performance and consumer confidence is a leading indicator of consumer spending, so both of them can strengthen the greenback in case higher numbers are posted. Wednesday we take a first look at Eurozone inflation with the release of the Flash Estimate Consumer Price Index but also at United States jobs data, with the release of the ADP Non-Farm Employment Change. Thursday’s headline is the release of the U.S. Manufacturing PMI, a survey of purchasing managers regarding business and economic conditions in the manufacturing sector and the week ends Friday with the most important U.S. jobs data: the Non-Farm Payrolls. The indicator is known for its high impact so we expect strong moves and we recommend caution. Early last week we saw a strong move up but after that, the pair started to move sideways and remained in a tight range, just below the 50 days Exponential Moving Average. Usually after a period of tight sideways movement, the pair tends to shoot strongly to one side or the other. We have two important barriers: on one hand there’s the 50 days EMA combined with 1.2480 as resistance and on the other hand we have the bullish trend line seen on the chart above as support. A clear break of either resistance or support will probably trigger an extended move in that direction but until that happens, we can expect the pair to continue to move in a range. Wednesday the Bank of England will release their Financial Stability Report, which is an assessment of current economic conditions as well as risks to financial stability and can offer hints about future monetary policy. The impact is different with each release but can generate strong movement for Pound pairs. Thursday the Manufacturing PMI is released, followed Friday by the Construction PMI. These are leading indicators of economic health, derived from the opinions of purchasing managers from the respective sectors but usually the impact is strong only if the actual reading shows a big difference compared to analysts’ forecast. As always the U.S. events will have a direct and strong impact on the pair. Weekly Analysis: For the entire last week the pair showed choppy movement, with sudden changes of direction. The week ended higher than it started but the downtrend is still intact. After the touch of 1.0525 support the sellers lost their steam and the pair started to move north but it’s clear that overall there’s still bearish pressure. 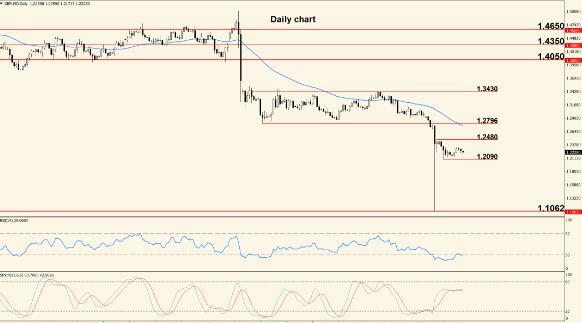 The Stochastic and Relative Strength Index have exited oversold territory and are moving upwards, supporting an extended move that will encounter the first resistance at 1.0710. If that level is surpassed, the next target may be 1.0800 zone and the 50 period Exponential Moving Average. As long as these resistances are holding, our view is bearish and we expect a move lower after a touch of one of the mentioned zones. We have a slow week ahead compared to the previous, with only a few important releases: Monday the Eurogroup Meetings take place, attended by personalities from the EU member states. Tuesday the ECOFIN Meetings, attended by Finance Ministers from the EU member states will be the main event but both assemblies may go mostly unnoticed by the market. Wednesday is a lackluster day and Thursday action picks up with the ECB Interest Rate announcement, which is followed shortly by the usual Press Conference during which ECB President Mario Draghi delivers a prepared statement and answers journalists’ questions. The press conference is almost always a reason for increased volatility and irregular movement. Friday the US Dollar takes center stage with the release of the University of Michigan Consumer Sentiment, a survey that acts as a leading indicator of consumer spending. 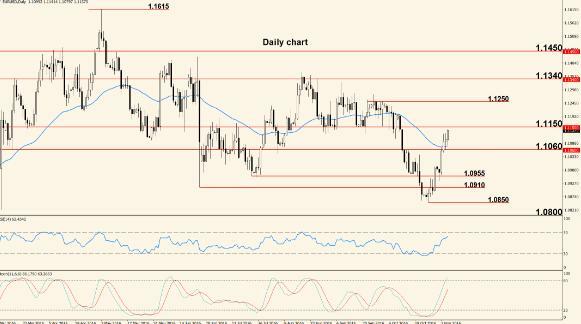 Last week was an important one for the Pound as it finally managed to climb above 1.2480 resistance and above the Moving Average. This marks the end of the ranging period and possibly calls for further upside. The 50 days Exponential Moving Average was surpassed last week for the first time in a long while (it was breached before but price returned immediately below it) and now price is trading above previous resistance (1.2480). All this makes us anticipate a move into 1.2855 zone and a continuation of the breakout but we don’t exclude a drop to test the recently broken level as well as the 50 EMA. If these barriers reject price, this will solidify the medium term control of the bulls. 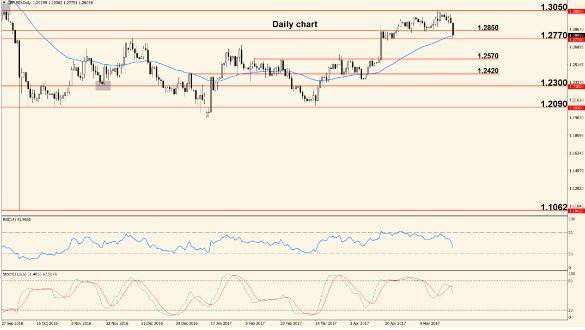 Similar or the Euro and US Dollar, the Pound has a lackluster week ahead, with only two notable releases: Monday we have the Services PMI, a survey of purchasing managers regarding business and economic conditions in the service sector and Wednesday the Manufacturing Production comes out. The latter shows changes in the total value of goods produced by the manufacturing industry and can have a positive impact on the Pound if it posts higher numbers because this would suggest increased economic activity. Weekly Analysis: Last week we experienced interesting price behavior, with the pair climbing fast but dropping the entire distance back to where it started by the end of the week. Most of the Euro weakness was generated by Mario Draghi’s press conference and his comments which were perceived as dovish. The resistance at 1.0850 and the 50 days Exponential Moving Average were breached last week but soon after, price returned below these technical levels and now the pair is testing the key support at 1.0525. If 1.0525 is broken, the next target is 1.0460, a level that was last tested in 2015 and before that, in 2003 so we can say that the bears will score a major victory if they manage to break the level. The latest impulse is bearish but last week’s price action was hectic so a clear prediction is hard to make. If 1.0460 is touched, we expect small bounces to occur but the Fed rate decision will play a major role for the next direction. The German ZEW Economic Sentiment survey released Tuesday is the only major indicator of the first 2 days of the week but Wednesday action intensifies with the release of the U.S. Retail Sales and more importantly, the FOMC will announce their decision regarding the interest rate. Some analysts expect a rate increase but even if this is not the case, the event will surely create strong movement. Half an hour after the rate is announced, Fed Chairwoman Janet Yellen will hold a press conference, discussing the rate vote and answering journalists’ questions. Thursday we take a look at U.S. inflation with the release of the Consumer Price Index (CPI), which is another reason for increased volatility and the week ends Friday with the Final version of the Eurozone CPI. Although this is the least important out of the three versions, the Euro is likely to respond strongly to the data. The U.S. Building Permits are the last indicator of the week, released Friday as well. 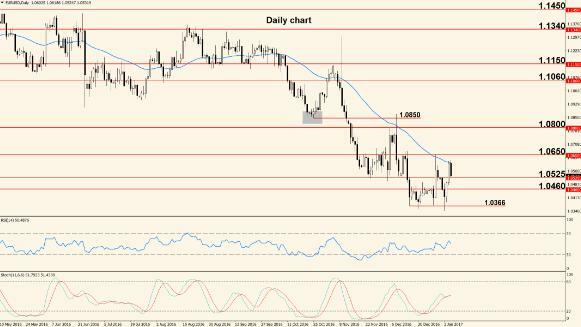 Last week the pair reached a high at 1.2775 then dropped 200 pips lower to end the trading week at 1.2575. The 50 days Exponential Moving Average is not broken but the bears control short term action. The pair’s behavior last week was bearish but the key support represented by the 50 days EMA and the level at 1.2480 wasn’t broken. A bullish trend line also supports price so we have three major elements that stand in front of falling price and the possibility of a push up shouldn’t be overlooked. On the other hand, a break of this confluence zone will show that the selling pressure is high and would make our bias for the week bearish. The first Pound-affecting release of the week is scheduled Tuesday in the form of the British Consumer Price Index, the main measure of inflation. The indicator usually has a high impact on the Pound’s direction, with higher numbers strengthening it. Wednesday’s highlight is the release of the Claimant Count Change, an indicator which shows changes in the number of people who asked for unemployment related benefits during the previous month. Thursday we take a look at British Retail Sales numbers and the Bank of England will announce the interest rate (no change expected). At the same time the MPC Members’ votes are released, as well as a Monetary Policy Summary that contains details of the reasons that determined the rate decision. Friday we don’t have major indicators and as always, the U.S. releases will have a direct and possibly strong impact on the pair. Weekly Analysis: The Fed hiked the interest rate last week and hinted towards three more increases over the course the next year. The US Dollar strengthened considerably as a result and the pair broke 2015’s lowest price, located at 1.0462. Last time the pair traded at such low levels was in the year 2003 so we can say that last week the pair has reached a historical low at 1.0366. Now price is testing the previously broken level at 1.0460, which may turn into resistance and reject price lower; if this is the case, we expect to see a move below 1.0366, otherwise the next destination is 1.0525 zone. Overall the bias is bearish and the Dollar is in control but bullish pullbacks are not out of the question; also keep in mind that Christmas is approaching and this will probably have an impact on the market. The week ahead is very slow in terms of economic releases, probably because the winter holidays are approaching. However, there are a few releases worth mentioning and keeping an eye on: Monday the German IFO Business Climate survey will show the opinions of about 7,000 businesses about economic conditions and outlook for the next 6 months. The large sample is what makes this survey important but the release doesn’t create strong movement all the time. Wednesday we take a look at the U.S. house market with the release of the Existing Home Sales and Thursday will be the busiest day of the week: the Durable Goods Orders come out, as well as the Final Version of the U.S. Gross Domestic Product. The GDP is an economy’s main gauge of overall performance but the Final version is the least important so we may see a mild impact. The last release of the week is the U.S. New Home Sales, scheduled Friday. The US Dollar was boosted by the Fed decision and of course, this was the highlight of last week. The Bank of England also announced their rate decision but no changes were made so the event didn’t generate strong movement. The bullish trend line seen on the Daily chart above was broken last week, as well as the Moving Average and the level at 1.2480. 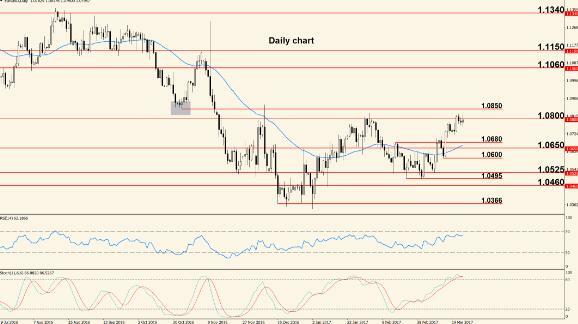 These are all signs that price may continue lower, towards the bottom of the range, at 1.2090. However, this is a long distance that will not be traveled during the course of one week unless surprising developments take place. Our bias is bearish but a quick move above the three elements mentioned before (trend line, EMA and 1.2480) would probably start a ranging period. Similar to the Euro and US Dollar, the Pound has a light economic calendar, with the only important releases being the Public Sector Net Borrowing, scheduled Wednesday, the Current Account (value difference between imported and exported goods), scheduled Friday and the Final GDP the same day. All these are considered medium-impact indicators but they can generate volatility if the actual number shows a big difference compared to the forecast. Weekly Analysis: Last week the pair’s movement was affected by end of year volatility and we expect this to continue throughout the week that just started. So far support is holding and rejecting price higher but price lacks the necessary steam to blow through resistance. 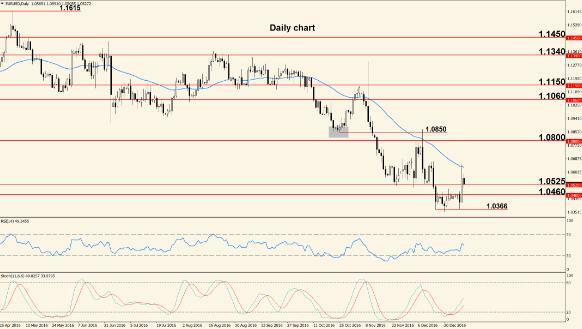 After starting last week on a bearish note and piercing through 1.0366 support, the pair retraced higher and is now testing 1.0460 resistance. Both oscillators are showing bullish divergence (price is making lower lows while the indicators are only showing a higher low) and this is a warning that further upside may follow. Keep in mind that it’s only a warning, not a clear signal and the pair is in a downtrend so we cannot exclude the possibility of a move below 1.0366 support. Probably price action will be choppy and affected by Christmas and the changing of the year. This entire week will be affected by the Winter Holidays and by the changing of the year so the economic calendar is light and volatility will be affected. Monday German banks will be closed in observance of Boxing Day, Italian banks due to St. Stephen's Day and U.S. banks are also closed in celebration of Christmas Day. Tuesday the U.S. Consumer Confidence survey is released, showing the opinions of about 5,000 households regarding current and future economic conditions. Wednesday the U.S. Pending Home Sales will affect the US Dollar, but the effect should be limited because this is considered an indicator with medium impact even under normal circumstances. Thursday and Friday we don’t have anything major on the economic calendar but the approaching of New Year’s Eve will trigger irregular movement and alternating periods of high and low volatility, thus caution is recommended. The pair completed another bearish week and moved clearly below the 50 days Exponential Moving Average but towards the end of the period, price slowed down, probably affected by the Winter Holidays. This is the last week of the year, so volatility will be irregular and price action choppy. It’s very likely for the pair to remain between 1.2480 and 1.2090, with a bearish bias as long as price is trading below the 50 period Exponential Moving Average. The last few days have been bearish but candles are small and lack momentum, indicating that we may see a small push up this week. The environment is risky, thus caution is recommended. Monday and Tuesday UK banks will be closed in observance of Boxing Day and Christmas Day respectively, so price action will be heavily affected. The rest of the week lacks important releases and we expect irregular, possibly sideways movement. Weekly Analysis: As expected, the last week of 2016 was governed by low liquidity and irregular price action. The quick climb is mostly attributed to these factors, not necessarily to fundamental or technical reasons. This type of behavior will likely extend to the week that just started. 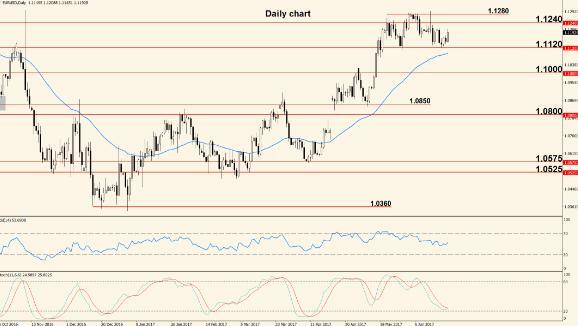 The pair has reached the 50 days Exponential Moving Average and bounced lower, erasing some of the Euro gains. As mentioned above, the low liquidity characteristic for end of year has played an important role in the move and we cannot predict if it will continue through the 50 EMA or bounce lower through 1.0525 and 1.0460. We expect the first part of the week to be affected by irregular price action and the second part to be more robust. Monday U.S. banks are closed, celebrating New Year’s Day, thus no major indicators will be released and volume will be low. Tuesday action picks up with the release of the German Preliminary Consumer Price Index, an indicator that is considered the main gauge of inflation; the same day we take a look at the health of the U.S. Manufacturing sector with the release of the Manufacturing PMI survey. Wednesday’s highlight is the release of the FOMC Meeting Minutes, a document that offers insights into the reasons that determined the Fed latest rate hike and Thursday we take a first look at the U.S. jobs market with the release of the ADP Non-Farm Employment Change. Probably the most important event of next week takes place Friday with the release of the U.S. Non-Farm Payrolls, a report that shows how many new jobs were created during the previous month. This is widely considered the most important U.S. employment data and usually has a very strong impact in the US Dollar. The pair remained below the 50 days Exponential Moving Average for the entire last week, with choppy movement and low liquidity; the last three days were the most active but a clear direction did not emerge. As long as the pair is trading below the 50 period Exponential Moving Average, our view is bearish but we acknowledge the fact that price may move erratically, at least during the first part of the week, due to low liquidity. The levels to watch are 1.2480 (1.2500) as resistance and 1.2090 as support and we slightly favor a move lower after a bounce at resistance but only if the 50 EMA will remain above price. Caution is still recommended throughout the week. UK banks will be closed Monday, celebrating New Year’s Day and action picks up Tuesday with the release of the Manufacturing Purchasing Managers’ Index (PMI), followed Wednesday by the Construction PMI and Thursday by the Services PMI. These are surveys of purchasing managers from the respective sectors, which act as leading indicators of economic health and optimism. The impact is usually moderate but differs from release to release. As always, the pair will be directly impacted by the U.S. indicators scheduled during the week. WEEKLY ANALYSIS: RESISTANCE TESTED. DOWNTREND IN TROUBLE? Weekly Analysis: The week that just ended was governed by sharp reversals and overall choppy but volatile movement. The pair breached support and then jumped higher to touch the 50 days Exponential Moving Average, where it reversed again. The support zone around 1.0366 rejected price higher again but the pair seems to have found resistance at the 50 days Exponential Moving Average and is now trying to move below 1.0525. As long as price remains below the 50 EMA, our view is still bearish but we must note that 1.0366 is a strong support zone that couldn’t be broken on several attempts, so the downtrend may be coming to an end if the bears cannot break this key support soon. The week ahead is slow in terms of economic announcements; the first notable release is scheduled Tuesday in the form of the U.S. JOLTS Job Openings, an indicator that shows the number of job openings, without taking into consideration the farming industry. It acts as a leading indicator of employment but its impact is often muted. Wednesday is another slow day, without major data coming out, while Thursday the only notable indicator that can have an impact on the pair is the U.S. Unemployment Claims. The busiest day of the week will be Friday, with three important releases: the U.S. Core Retail Sales (measures changes in the value of sales made through retail outlets, excluding automobiles), the Producer Price Index (shows changes in the price charged by manufacturers for their goods) and the University of Michigan Consumer Sentiment survey that tries to gauge consumers’ confidence in current and future economic conditions and acts as a leading indicator of consumer spending. Last week the pair showed bullish behavior but once the 50 days Exponential Moving Average was touched, the direction changed and most of the Pound gains were erased. The bearish bounce seen at the 50 days EMA may be an indication that the bulls have ran out of steam and that an extended move lower may follow. Our view remains bearish as long as the pair is trading below 1.2480 resistance and below the EMA, and we anticipate a move closer to 1.2090 this week. A break above the two elements that were just mentioned, would open the door for a move into 1.2855 during the weeks to come. Similar to the other two currencies, the Pound has a lackluster week ahead, with only two notable indicators, both released Wednesday. The first is the Manufacturing Production, a report that shows changes in the total value of goods produced by the manufacturing sector and the second is the NIESR Gross Domestic Product Estimate, which shows changes in the estimated total value of output generated by the economy during the previous 3 months. Other than these two indicators, the pair will be mostly influenced by the technical aspect and by the U.S. announcements. 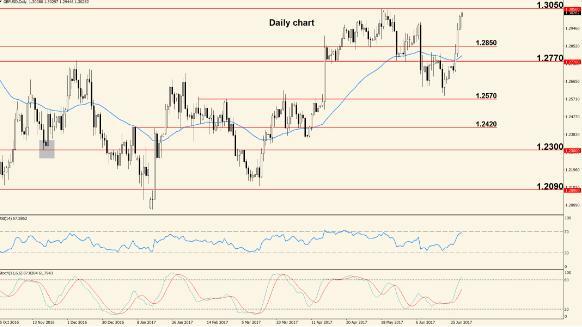 Weekly Analysis: The pair ended the week higher than it started it, mostly because the US Dollar was weakened by U.S. President-Elect Trump’s speech delivered last Wednesday. Throughout the week, price action was choppy and showed sharp reversals. After a perfect touch of 1.0460 support, the pair rallied and broke the 50 period Exponential Moving Average. Now it is testing 1.0650 resistance but as we can see from the chart above, the last three Daily candles show long wicks and this is a sign of indecision, which was mostly generated by the way that market participants interpreted President-Elect’s speech on Wednesday. If the US Dollar weakness will continue, we will probably see an extended move above 1.0650 and closer to 1.0800 zone, otherwise price will drop through the 50 EMA and into the support zone between 1.0525 and 1.0460. From a longer term perspective the pair is still in a downtrend, which was severely weakened by the multiple failed attempts to break the support zone around 1.0366. Monday U.S. banks will be closed in observance of Martin Luther King Day and there are no major releases on the Euro side either, so we expect a slow, possibly ranging session. Tuesday the World Economic Forum (WEF) Annual Meetings start in Davos, attended by personalities from the political and financial scene from around the globe (over 90 countries); the event may generate volatility on the market but of course the actual impact will depend on the matters discussed so we cannot anticipate it. The Meetings will continue throughout the entire week, thus caution is recommended. Wednesday we take a look at U.S. inflation with the release of the Consumer Price Index, an indicator that shows changes in the price paid by consumers for the goods and services they purchase, and Thursday the focus shifts towards the Euro for the ECB interest rate announcement and the usual press conference that follows. The rate is not expected to change but as always, this event should be treated with caution because volatility may surge, especially during the part of the press conference when ECB President Mario Draghi answers journalists’ questions. The trading week ends Friday without any major event, other than the WEF Meetings. Last week the pair established a new low at 1.2037 but retraced higher soon afterwards and price action continued to be choppy from then on. For now price is still in a range, without a clear bias. The support zone around 1.2090 was breached but not broken and direction is not clear, as indicated by the sideways movement and the long tails of the candles. However, price is making lower lows and lower highs and these are the characteristics of a downtrend but until 1.2090 is clearly broken, we will consider the pair in a range, capped by the mentioned support and the 50 period Exponential Moving Average to the upside. A clear break of either one of these elements will increase the chance of an extended move in that direction. The week ahead holds three major releases for the Pound: Tuesday the CPI will offer insights into British inflation and Wednesday we take a look at the jobs situation in the U.K. with the release of the Claimant Count Change, an indicator that shows changes in the number of people who asked for unemployment related benefits. The last major release of the week is scheduled Friday in the form of the British Retail Sales, which account for a major part of the entire economic activity. U.K. representatives will attend the WEF Meetings throughout the week, thus caution is recommended. Weekly Analysis: Last week Donald trump became the 45th President of the United States, assuming office on January 20, 2017. 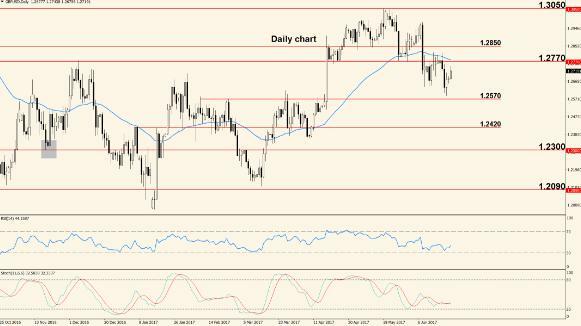 The pair had a bullish week overall, with US Dollar weakness and remained above the Daily Moving Average. Even if the bears are making attempts to take the pair lower, the buyers quickly erase them and price ends up higher. This was the case last week when it appeared that the 50 days Exponential Moving Average will be broken to the downside but then price quickly reversed and started to move north, so the bias remains bullish and we expect to see a move close to the resistance around 1.0800. As an alternate scenario, a quick drop below the 50 days EMA would open the door for a touch of 1.0525 support and would make the short term bias bearish. Monday is a slow day, without major announcements but Tuesday action picks up and we take a look at the health of the German Manufacturing and Services sectors with the release of the respective PMIs. The same day the United Kingdom’s High Court will decide whether the government can initiate or not Article 50 without the approval of the parliament. This will surely affect the Euro as well, not only the Pound so we recommend caution. Wednesday’s highlight will be the German IFO Business Climate, a survey that tries to gauge the opinions of about 7,000 businesses about economic conditions and a 6-month outlook, while Thursday’s only notable release is the U.S. New Home Sales. Action picks up Friday again with the release of the U.S. Advance Gross Domestic Product and Durable Goods Orders, both important indicators for the American economy and with the potential to strongly affect the US Dollar in the short to medium term. 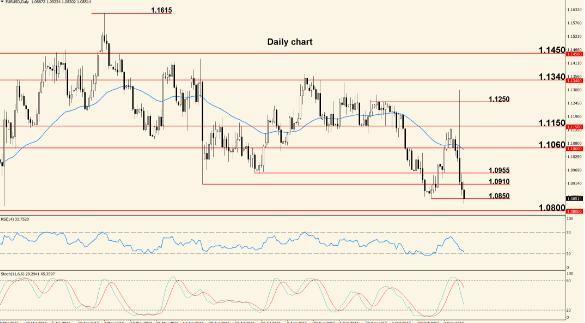 The Pound strengthened last Tuesday when UK Prime Minister Theresa May delivered a hawkish speech regarding the conditions of the Brexit but the pair remained in a range for the rest of the week. After a small dip below 1.2090 support, the pair climbed and is now trading very close to the 50 days Exponential Moving Average, with a bullish bias. For this week we expect a move into 1.2480 but from a longer term perspective the pair is still in a downtrend and the 50 EMA is not yet clearly broken, so another move below 1.2090 should not be counted out. The Brexit situation will also play a major role for this week’s price direction. This week we have only two major events for the Pound: the first is the EU Membership Court Ruling, scheduled Tuesday, and has the potential to be a significant market mover, so extra caution should be used. The second event is the British Preliminary Gross Domestic Product, scheduled Thursday and showing the overall performance of UK’s economy. As always, the U.S. events released throughout the week will have a direct impact on the pair as well. Weekly Analysis: Last week the bears managed to erase some of the advances made by the buyers and we saw a pullback to the previous support; however, the pair remained above the 50 period Exponential Moving Average and the short term bias is still bullish. As long as the pair remains above 1.0650 support and above the 50 days EMA, the bulls remain in control of price dynamics, so we consider the current down move a retracement in a short term uptrend. This means that price is likely to rally again, aiming for 1.0800 resistance, followed by 1.0850. If these barriers cannot be surpassed this week, it would mean that the buyers’ strength is starting to fade and this will increase the chance of a reversal. 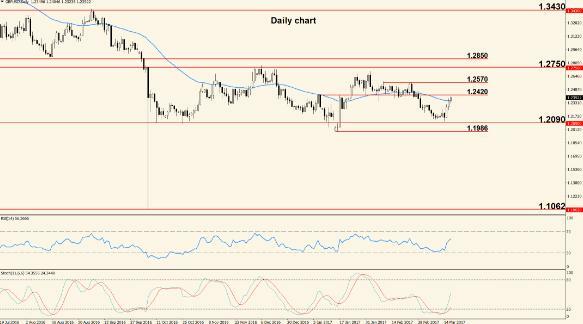 A bearish break of the 50 EMA will make 1.0525 the target for the week. The week starts Monday with a first look at German inflation with the release of the Consumer Price Index, followed Tuesday by the U.S. Consumer Confidence, a survey that acts as a leading indicator of consumer spending. Wednesday the Fed will announce the interest rate, which is not expected to change but the accompanying FOMC Statement will offer hints about future monetary policy and possibly about the next hike. Thursday is a slow day for both Euro and US Dollar but Friday we will probably see the strongest movement due to the release of the U.S. Non-Farm Payrolls. This is widely considered the most important jobs data for the U.S. economy and almost always volatility surges at release. Last week, UK’s High Court ruled that the Government must get Parliament’s approval before triggering Article 50, which would initiate the Brexit. The Pound got a boost from this decision and the pair climbed almost 300 pips during the week. The pair is trading above the 50 period Exponential Moving Average and shows bullish momentum but the Stochastic has started to turn downwards in overbought territory, warning of a potential retracement. 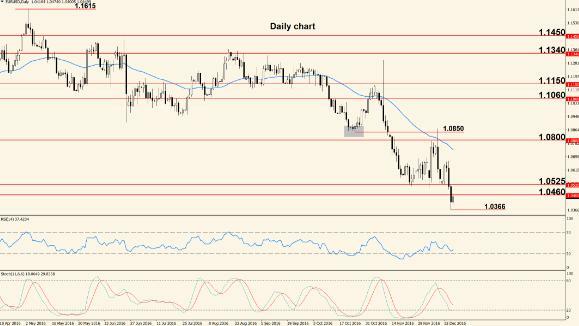 If price pulls back, we expect it to find support around 1.2420 and there, bullish price action is likely to resume, aiming for 1.2750 at the top of the range. As an alternate scenario, a drop below 1.2420 and below the 50 EMA would open the door for a move towards the bottom of the range (1.2090 zone). The first notable release of the week is the Manufacturing PMI, scheduled Wednesday and followed Thursday by the Construction PMI. The same day the Bank of England will release their Inflation Report and Governor Carney will hold a press conference discussing the contents of said report; also, the Official Bank rate is announced, with no change expected from the current 0.25%. The week ends Friday with the Services PMI, a survey derived from the opinions of purchasing managers from the respective sector, regarding economic and business conditions. Weekly Analysis: U.S. data released throughout last week was mostly bearish and the Fed kept the rate unchanged, without hinting about a March hike. Also the NFP report showed more jobs but with a lower hourly wage and this increased market confusion. The pair is under pressure and struggling to decide the next direction; Thursday’s candle has a long upper wick while Friday’s candle has a long lower wick, both showing opposing signals and an unstable environment. The support at 1.0710 rejected price higher but 1.0800 resistance pushed it lower after a brief climb above, so these will be the levels to watch early in the week; a break of either one will likely generate an extended move in that direction. The 50 period Exponential Moving Average is still angled upwards and below price, thus making the bias bullish but the up move is becoming more and more fragile. The first two days of the week are quiet, without major economic announcements but Wednesday United Kingdom’s Parliament will vote to decide if they will confer power to the Prime Minister to trigger Article 50; this will likely affect the EUR/USD pair as well. Thursday the U.S. Unemployment Claims are the only notable event and the week ends Friday with the release of the University of Michigan Consumer Sentiment, a survey that tries to gauge the opinions of about 500 respondents regarding current and future economic conditions. The survey acts as a leading indicator of consumer spending, which in turn represents a major part of the entire economic activity. 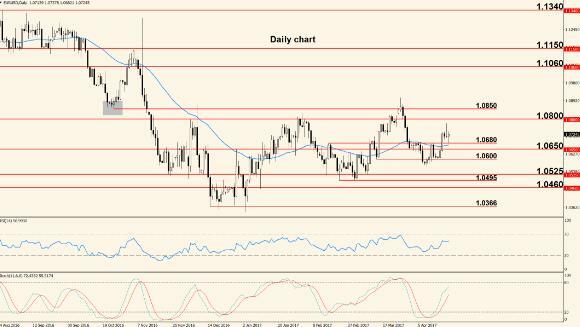 The Pound-Dollar showed mixed behavior last week, first climbing to establish a new high and then dropping to the levels seen at the beginning of the week. Most of Pound’s losses occurred when the Bank of England released the Inflation Report and Governor Carney adopted a cautious stance. The move up seen during the last weeks seems to have hit a dead end as the bulls failed to decisively break the previous high and to touch 1.2750 resistance. Currently the bears are testing 1.2420 support, with the 50 period Exponential Moving Average in close vicinity; if this confluence zone will be broken early during the week, then the bears are likely to regain control of the pair but a failed attempt would make 1.2750 the target for the week. The first highlight of the week ahead is the EU Membership Vote, scheduled Wednesday. The Parliament will decide if they give power to the Prime Minister to notify the European Union about UK’s intention to leave the union, by invoking Article 50 of the Lisbon Treaty. Volatility will probably increase and we recommend caution throughout the day, especially because the exact time of the vote is not yet known. Please note that the date may change as well. Friday the British Manufacturing Production will show changes in the total value of goods produced by the manufacturing sector and the same day NIESR will release an estimate of the British Gross Domestic Product. Overall we have a slow week ahead, with the EU Membership Vote being the key event. Weekly Analysis: Last week’s price action confirmed 1.0800 as a very strong zone of resistance and the pair bounced lower once it reached it. Now price is trading below the 50 days EMA and the bears are in control of short term movement. The bearish bounce at 1.0800 followed by the break of the 50 period Exponential Moving Average shows that the balance of power is shifting again and that we may enter an extended period of downside movement. However, Friday’s candle shows a relatively long wick and 1.0650 support is not decisively broken, so a move higher is not out of the question. If early in the week the pair moves above the 50 EMA, we expect to see another test of 1.0800 and on the other hand, if it remains below the line, the next likely destination is 1.0525 zone. The first major release of the week ahead is the German Preliminary Gross Domestic Product, scheduled Tuesday. The German economy is an important pillar of the entire Eurozone and the GDP is the main gauge of performance, thus higher numbers usually strengthen the Euro. The same day Fed Chair Yellen will testify on the Semiannual Monetary Policy Report before the Senate Banking Committee. Wednesday is a strategic day for the US Dollar as we take a first look at the always-important U.S. Consumer Price Index (measure of inflation), but also the U.S. Retail Sales and later in the day Fed Chair Yellen will testify again, this time before the House Financial Services Committee. Thursday’s highlights are the U.S. Building Permits (a higher number suggests increased activity in the construction sector) and the Philly Fed Manufacturing Index, a survey that acts as a leading indicator of economic health, focused on the Philadelphia district. Friday is a light day, without any major releases. The week that just ended was slow, with price action confined in a tight range above the 50 days Exponential Moving Average and above 1.2420 support. This tight squeeze may be followed by a strong breakout. For the entire last week price remained above 1.2420 and above the 50 days EMA, moving almost completely sideways and leaving no clear clues about future direction. From a longer term perspective the pair is in a channel, with 1.2750 as the upper barrier and 1.2090 as the lower one, so until a clear breakout is seen, price will bounce between boundaries. The mentioned breakout may occur this week and even if it doesn’t, we expect to see a lot more action than last week, mostly because lately price has been trading in a very tight range and this is usually followed by a strong move. The Pound will be affected by three major releases this week: Tuesday the Consumer Price Index comes out, followed Wednesday by the Claimant Count Change (indicator that shows how many people asked for unemployment related benefits) and Friday by the British Retail Sales. These are all major indicators that can have a strong effect on the Pound and the pair will also be affected by the U.S. events throughout the week. 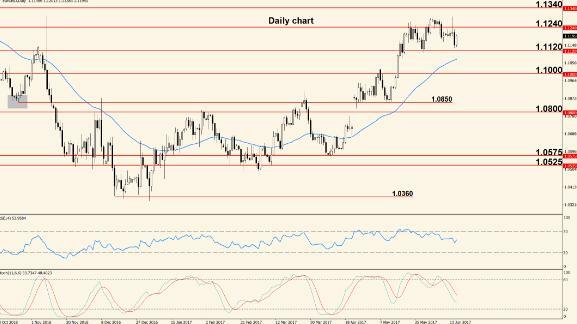 Weekly Analysis: After reaching the weekly target at 1.0525, the pair bounced higher immediately and tested resistance. Most of the Dollar weakness was triggered by a rather dovish stance adopted by Fed Chairwoman Janet Yellen. 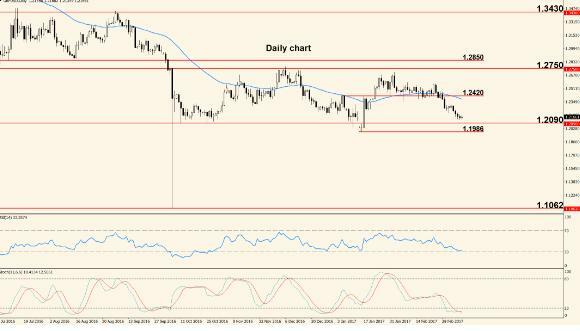 After reaching the resistance zone between 1.0650 and 1.0680, which coincides with the 50 period Exponential Moving Average, the pair started to show signs of rejection and now bearish pressure is growing. If the pair cannot break 1.0680 early during the week, we expect the bears to take over and nullify the gains posted by the bulls last week; this will make 1.0525 the target for this week as well, possibly extending to 1.0460. To the upside, if 1.0680 is broken we expect to see a move into 1.0800. Monday U.S. banks will be closed in celebration of Presidents’ Day, thus no major indicators will be released; the Euro also has a slow day, without notable announcements so we expect a ranging trading session. Tuesday we take a look at the state of the German Manufacturing sector with the release of the Manufacturing Purchasing Managers’ Index and Wednesday will probably be the most important day of the week for the US Dollar as the FOMC will release the Minutes of their latest Meeting, which will probably offer hints about a future rate hike but also insights into the reasons of the latest rate vote. Thursday’s only notable event is the release of the U.S. Unemployment Claims, an indicator that shows how many people asked for unemployment benefits during the previous week and the last release of the week is the U.S. New Home Sales, scheduled Friday. 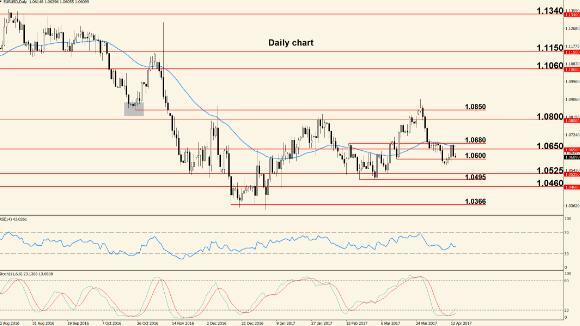 The Pound-Dollar completed another lacklustre week, with price moving almost sideways. The bears made some timid advances, mostly on the back of disappointing UK economic data but support is still holding and neither side is in clear control. The 50 period Exponential Moving Average is flat, without indicating a clear direction and price is moving sideways, close to support. This has been the situation for a couple of weeks now and the probability of a strong breakout grows with each passing day but the direction is hard to anticipate. It looks like now the bears are trying to break 1.2420 but movement is incredibly choppy and for the time being we recommend caution with this pair. The Pound also has a lacklustre week ahead, with only one major release: the Second Estimate Gross Domestic Product, scheduled Wednesday. The GDP is the primary measure of overall economic performance but the Second version is less important than the Preliminary so the impact may be mild; however, higher values usually strengthen the currency. As always, the U.S. events mentioned earlier will have a direct impact on the pair’s performance throughout the week. Weekly Analysis: The pair remained below the 50 days Exponential Moving Average last week but price action was mixed and showed strong rejection at support. The FOMC Minutes showed that a rate hike may come fairly soon and this is likely to create US Dollar strength in the near future. The support at 1.0525 appeared to be broken last week but price soon returned above it despite hints of a nearing Fed rate hike. On the other hand, the last daily candle is bearish and shows a long wick in its upper side, which is a sign of rejection and a warning sign that the pair may test 1.0525 again. 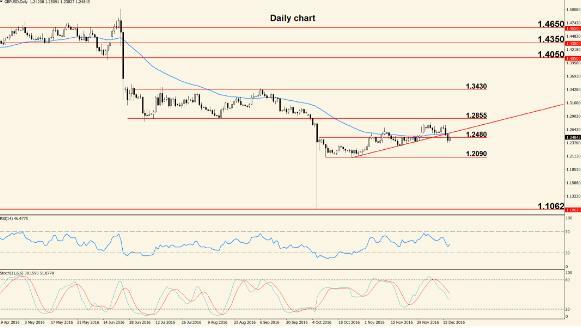 If that support is broken, we expect to see a touch of 1.0460 but a break of this level will probably come only if the U.S. economic data released throughout the week will add USD strength. To the upside, the 50 days EMA is the first strong resistance and as long as the pair is trading below it, our bias is bearish. The week opens Monday with the release of the U.S. Durable Goods Orders, an indicator that shows changes in the total value of purchase orders for goods with a life expectancy of more than three years. Tuesday will be a busier day, with two important releases for the US Dollar: the Preliminary Gross Domestic Product, which is the main gauge of overall economic performance and a Consumer Confidence survey that shows the opinions of about 5,000 households regarding economic conditions and acts as a leading indicator of consumer spending. Wednesday the first major European indicator will be released: The German Preliminary Consumer Price Index (main gauge of inflation for the German economy) but also the U.S. Manufacturing PMI, a survey of purchasing managers, focused on the health of the manufacturing sector. Thursday we take a look at overall European inflation with the release of the CPI Flash Estimate and the week ends Friday with the release of the U.S. Non-Manufacturing PMI (also called Services PMI), which is another survey of purchasing managers, this time focused on the services sector. Although volatility increased last week, the pair continued to show mixed movement, without a clear direction and is now trading very close to the 50 days Exponential Moving Average, which is almost flat. Thursday’s climb was nullified Friday almost entirely and the pair finished the week very close to where it started it, so not much has changed in terms of direction but at least volatility is higher now and this increases the chances of a stronger move and a potential trend. We recommend caution when trading this pair because as seen from last week’s price action, control doesn’t clearly belong to either side and all moves to one side can be quickly reversed. This week will be focused on surveys of British purchasing managers: Wednesday the Manufacturing PMI will be released, followed Thursday by the Construction PMI and Friday by the Services PMI. All these surveys act as leading indicators of economic health, focused on their respective sector, with higher numbers showing optimism and usually strengthening the Pound. As always, the U.S. releases will have a direct impact on the pair throughout the week. Weekly Analysis: Last week we saw a bounce lower from the 50 days Exponential Moving Average but all the US Dollar gains were erased Friday despite Fed Chair Yellen’s speech that was considered hawkish by many. Now the pair is back to the highs of the previous week. The pair established support at 1.0495 and bounced higher with strong momentum but it is now facing the 50 days Exponential Moving Average, which is angled downwards. The US Dollar had a surprising reaction to Janet Yellen’s speech but it must be noted that she mentioned a possible rate hike at the next Fed meeting and this will probably trigger USD strength in the near future. If the 50 EMA is broken, the pair still faces strong resistance ahead (1.0650 – 1.0680), whilea bounce lower will take price into the strong support zone between 1.0525 and 1.0495; if these zones are not decisively broken, the pair is likely to enter a ranging period. The first two days of the week lack major releases but the rest of the week is full of important events that are likely to generate strong movement. Wednesday we take a first look at U.S. jobs with the release of the ADP Non-Farm Employment Change, a report that shows changes in the number of employed people, excluding the government and farming sectors. Thursday the focus shifts to the Euro as the European Central Bank will announce the interest rate and ECB President Mario Draghi will hold his usual press conference, discussing the rate decision and answering journalists’ questions. The Q&A session is usually when volatility rises and irregular movement is often seen so we recommend caution if trading at the time. Friday will be the most important day of the week for the US Dollar as the Non-Farm Payrolls are released, showing changes in the total number of employed people during the previous month, excluding the farming sector. This is widely considered the most important U.S. jobs indicator that has a strong impact on the currency, mostly because a growing number of employed people means that consumer spending is likely to increase in the near future. 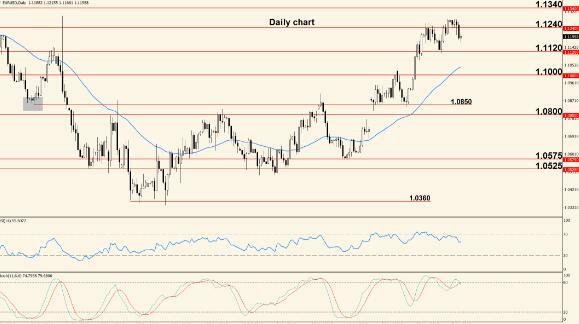 The Cable finally broke 1.2420 and started to move with a little more conviction last week; the British economic data was overall disappointing and this contributed to the pair’s bearish movement. This may be the start of a period with clearer movement, aiming for support. The break of the 50 days Exponential Moving Average and of the support at 1.2420 is an important victory for the sellers and is likely to generate additional bearish movement, with a test of 1.2090 key support. A lot will depend this week on the U.S. employment data but from a technical standpoint, we anticipate a move into the mentioned support. Pullbacks to the upside are very likely but as long as price remains below 1.2420, our view is bearish. Wednesday the HM Treasury will release the Annual Budget, outlining spending and income levels as well as planned investments and borrowing levels. The release can have a high impact on the currency, thus caution is recommended. The second important release of the week is the British Manufacturing Production, scheduled Friday. The indicator shows changes in the total value of goods produced by the manufacturing sector and acts as a leading indicator of economic activity. As always, the U.S. releases will have a direct and potentially strong impact on the pair’s movement. Weekly Analysis: After a bearish start of last week, the pair rallied during the last two trading days and pushed higher, testing resistance. Although the NFP report showed more jobs, hourly wages decreased and apparently this was the reason for US Dollar weakness. The pair bounced at 1.0525 support and broke through the 50 days Exponential Moving Average but it is now facing the resistance at 1.0680. 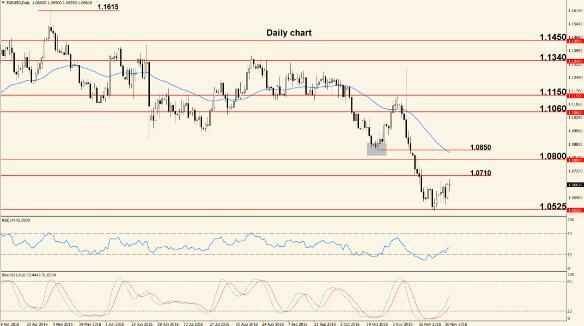 If this barrier is broken, we expect to see a climb into 1.0800 – 1.0850 this week but the US Dollar reacted surprisingly to the NFP report, weakening even if more jobs were posted. We may see some delayed effects of the NFP at the beginning of this week and if this is the case, the pair will drop back down into 1.0525. The week opens Monday with a speech delivered by ECB President Mario Draghi at the Massachusetts Institute of Technology Labs for Innovation Science and Policy Fostering, in Frankfurt. This may not have a high impact on the financial market but it is worth mentioning nonetheless and caution should always be used during speeches of heads of central banks. Tuesday the focus remains on the Euro for the release of the German ZEW Economic Sentiment, a survey of about 275 German analysts and professional investors, which tries to gauge their opinion about a 6-month economic outlook. The survey has a medium impact on the currency, with higher numbers showing optimism and strengthening the Euro. Wednesday will be the most important day of the week because the Fed will announce the interest rate, accompanied by a rate statement and followed soon after by a press conference held by Fed Chair Janet Yellen. Currently analysts expect a rate hike to <1.00% from the current <0.75% and if this happens, we will probably see US Dollar strength and a drop for the pair. Either way, the event is likely to generate increased volatility. Thursday the US Dollar will be affected by the release of the Building Permits (number of residential building permits issued during the previous month) and the week finishes Friday with the University of Michigan Consumer Sentiment survey. The same day the Group of 20 (G20) Meetings start, attended by finance ministers and central bankers from the member states. The pair completed another bearish week, approaching the key support at 1.2090, which is also the bottom of the channel that confined the pair for several months. If the support zone between 1.2090 and 1.1986 is broken, the pair will be out of the channel so we may see more directional movement and less choppiness. However, it must be noted that this is a strong support zone, the Stochastic is oversold and the Relative Strength Index is very close to its oversold level. *** these factors are likely to push the pair higher, creating a bullish retracement that may extend into the 50 days EMA. Two major events will affect the Pound directly this week: Wednesday the Claimant Count Change will show changes in the total number of unemployed people in the United Kingdom and Thursday the Bank of England will announce the interest rate as well as the Monetary Policy Summary. No change is expected for the rate, so unless the Monetary Policy shows some surprising information, the event will just create temporary volatility. Last week the Fed decided to hike the rate to <1.00% but their expectations for the rest of the year remained relatively low, anticipating only 2 more increases and this was generally perceived as bearish for the US Dollar. This was also the main reason for the pair’s strong climb. After failing to move below the 50 days Exponential Moving Average, the pair jumped, fueled by the fundamental side and is now headed towards the resistance zone between 1.0800 and 1.0850. We expect this zone to be reached early during the week and afterwards, the pair is likely to move lower, especially if the oscillators will become overbought by that time. Last week the pair bounced strongly at 1.0600, which is a psychological level (big round number) as well as a technical level so a potential move lower will likely find support there. The entire week ahead is light in terms of economic releases and the first two days actually lack major announcements altogether. Wednesday the first notable indicator is released: the U.S. Existing Home Sales, which offers insights into the American housing industry by showing the annualized number of homes sold in the previous month, but excluding new buildings. Thursday Fed Chair Janet Yellen will deliver a speech at the Federal Reserve System Community Development Research Conference and the same day the U.S. New Home Sales numbers come out, showing the annualized number of new homes sold during the previous month. Friday’s highlights for the Euro are the European Manufacturing and Services PMIs that will show the opinions of purchasing managers regarding the health of their respective sectors, while the US Dollar will be affected by the release of the Durable Goods Orders. Overall we have a slow week ahead, without major announcements, so the main focus will be on the technical side. The pair was boosted higher last week by two reasons: on one hand the US Dollar weakened due to low expectations for 2017 and on the other hand the Pound strengthened because one MPC member saw the need for a rate hike whereas before all 9 members agreed upon holding the rate unchanged. The support at 1.2090 proved once again that it is a strong barrier in front of falling price and pushed the pair higher, into the 50 days Exponential Moving Average (of course, the fundamentals outlined above played a major role). The most important level for short and medium term price action is located at 1.2420 and the way price behaves around it will offer hints about the rest of the week: a failed break will open the door again for 1.2090 support, while a clean break will make 1.2570 the first target for the week. Although the latest impulse is bullish, the pair is still in a range from a longer term perspective. The Pound will be affected by only two important scheduled releases: the British Consumer Price Index, which is the main gauge of inflation, showing changes in the price paid by consumers for the products they purchase and the Retail Sales, which show changes in the total value of sales made through retail outlets. The first indicator comes out Tuesday, while the second is released Thursday and as always, the pair’s direction will also be affected by the U.S. events. 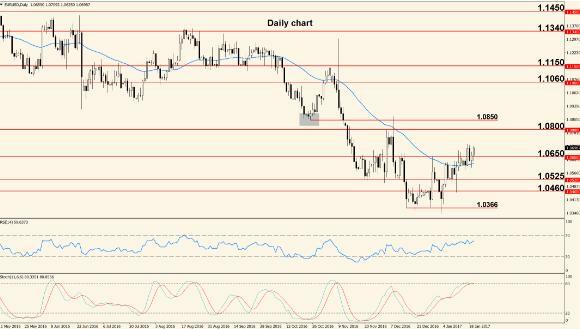 Weekly Analysis: Price action was choppy last week, apart from Tuesday when we saw a strong bullish push that took the pair into 1.0800 resistance. The buyers remained in control but strength faded after Tuesday’s climb. 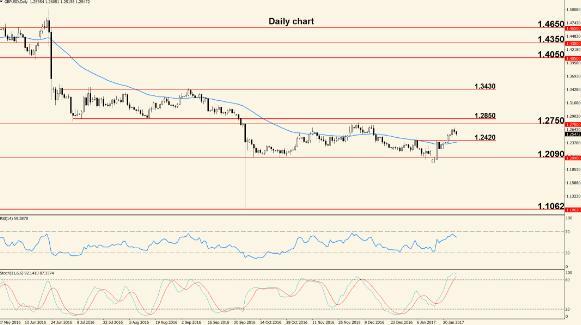 The pair has reached a strong resistance zone located between 1.0800 and 1.0850 and we can already see signs of bearish pressure: the Stochastic has reached overbought, candles have small bodies and long wicks and upside momentum is fading. During this week we expect another test of 1.0850, which will decide the next medium term direction. A break of said resistance will make 1.1060 the next target (not necessarily reached in one week), while a bounce will probably generate a drop into the 50 days Exponential Moving Average. The week starts Monday with the release of the German IFO Business Climate, a survey with a very large sample size of about 7,000 German businesses, focused on their opinions regarding economic and business conditions for the next 6 months. Tuesday the spotlight shifts towards the US Dollar for the release of the U.S. Consumer Confidence, another survey with a large sample size of about 5,000 households, focused on the respondents’ opinions regarding current and future economic conditions. Thursday we take a look at German inflation with the release of the German Consumer Price Index and on the US Dollar side we have the U.S. Final Gross Domestic Product, which is the last version in the series of three and tends to be the least impactful but remains a notable indicator nonetheless. Friday is a rather slow day, with the most notable indicator being the European Consumer Price Index, which shows changes in inflation across the EU. The Pound benefited from better than expected inflation readings last week and this was the main reason for the pair’s bullish bias. On top of that, the US Dollar seems weak against most of its counterparts and doesn’t show clear signs of strength. The pair established the 50 days Exponential Moving Average as support last week (broke above it and then bounced off of it) and the next destination seems to be 1.2570. From a longer term perspective the pair is still in a range and this means we should pay attention to the overbought position of the Stochastic, which may be an early warning of a reversal. If 1.2570 cannot be broken we expect to see a drop into the 50 days Exponential Moving Average. Almost the entire week lacks important releases and Friday will be the busiest day of the week, with 2 important indicators: the British Current Account, which shows the difference in value between imported and exported goods and services and the Final GDP, which is the main gauge of overall economic performance. Other than this, price action will be mainly driven by the technical aspect and the U.S. releases. Weekly Analysis: Last week the pair’s direction was controlled almost completely by the bears, with price dropping strongly for four days and breaking the 50 days Exponential Moving Average. Once the pair moved above 1.0850, it printed a long-tailed candle, showing rejection and quickly started to descend, breaking several support levels, as well as the 50 days EMA. This type of behaviour cannot be considered a simple retracement and instead, we expect a full scale reversal to the downside, with 1.0500 as main target. If the pair bounces higher at the current support (1.0650), we may see a move into 1.0800 but a break of that zone will depend on the fundamentals released this week. The week opens Monday with the release of the U.S. Manufacturing PMI, a survey of purchasing managers that acts as an indicator of optimism and economic health. A more important release is scheduled Wednesday: the FOMC Meeting Minutes, which will offer insights into the reasons behind the latest interest rate vote. If the Minutes will show that the Fed is likely to hike more times than expected this year, the US Dollar will probably strengthen but either way, this is an event that should be treated with caution. The last major event of the week is the release of the U.S. Non-Farm Payrolls, scheduled Friday. This is widely considered the most important U.S. jobs report and almost always has a very strong impact on the US Dollar; the indicator shows changes in the number of employed people during the previous month, excluding the farming industry, and higher values usually suggest that consumer spending will increase in the near future, a fact that strengthens the currency. The Cable had an interesting week, with mixed reaction but it remained trapped between support and resistance after a bounce at the 50 days Exponential Moving Average. The drop from 1.2570 resistance followed by the bounce at the 50 days EMA can be considered a simple retracement, and one that was expected because on the lower timeframes the pair was clearly overbought. However, it must be noted that 1.2570 acted as strong resistance in the past and last week the pair failed once again to surpass it, so if this week we will see another bounce lower from this level, the bears are likely to take control. If this happens, the first barrier will become the 50 days EMA and the support at 1.2420; keep in mind that the pair is still in a range from a longer term perspective. The Pound will be affected by three surveys this week: the Manufacturing PMI, Construction PMI and Services PMI, released Monday, Tuesday and Wednesday respectively. The surveys are derived from the opinions of purchasing managers regarding business and overall economic conditions in each sector and act as leading indicators of economic health. Higher numbers usually strengthen the Pound but the impact is often limited if the actual numbers match analysts’ expectations. 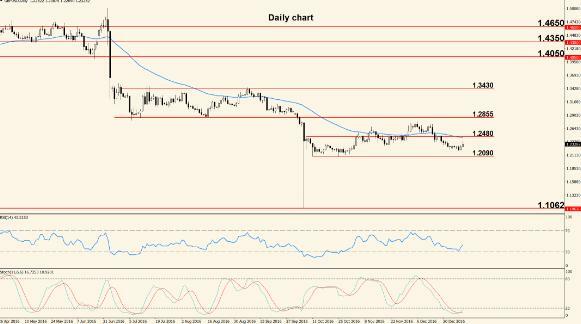 WEEKLY ANALYSIS: US DOLLAR STRENGTH – A SHORT-LIVED AFFAIR OR THE START OF A DOWNTREND? Weekly Analysis: Last week the pair had a very slow start, with choppy and almost sideways price action; however, the last couple of days made up for the previous lack of movement and the bears managed to take the pair below support. After pausing at the 50 days Exponential Moving Average, the pair started to show some determination, making us anticipate a continuation of the current bearish momentum. If this is the case, price will probably move towards the support zone created between 1.0525 and 1.0495, which is also the place where the last move up originated, so it’s an important zone for medium term price action. It must be noted that the Stochastic is below its 20 level and the Relative Strength Index is approaching its oversold level; if both oscillators enter oversold and price reaches strong support, we will probably see a bounce up. The first notable release of the week is the German ZEW Economic Sentiment, scheduled Tuesday. The survey shows the opinions of about 275 German professional investors and analysts regarding current economic conditions as well as a 6-month outlook; it acts as a leading indicator of optimism, with higher numbers strengthening the currency but the effect is usually mild. The next releases are scheduled Thursday and will affect the US Dollar: the Producer Price Index (an indicator that shows changes in the price charged by producers for their goods) and the University of Michigan Consumer Sentiment, a survey of about 500 consumers that tries to gauge their opinions regarding current and future economic conditions. Friday we take a look at Unites States inflation with the release of the Consumer Price Index and the same day the U.S. Retail Sales come out, showing changes in the total value of sales made through retail outlets. German banks will be closed in observance of Good Friday, so we expect volatility to be affected. 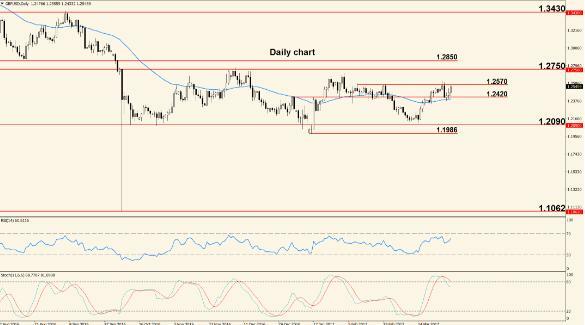 After another failed attempt to move above 1.2570 resistance, the pair started to drift lower last week, breaking support and shifting short term control towards the short side. However, from a longer term perspective, the pair is still in a range. The resistance at 1.2570 remains an important level that stopped rising prices once again and triggered a bounce lower, through the 50 days Exponential Moving Average. Even if there are some signs of bearish pressure (bounce at resistance, break of 50 EMA), the control doesn’t clearly belong to either side and the pair lacks momentum. The first level of importance is located at 1.2300, which acts as psychological support (big, round number) but also technical support because price bounced off of it in the past. To the upside, 1.2570 remains the first key level. The first release for the Pound is scheduled Tuesday in the form of the Consumer Price Index, which is the main gauge of inflation and usually has a strong impact on the currency, with higher values strengthening it. Wednesday we take a look at British jobs data with the release of the Claimant Count Change, an indicator that shows the change in the number of people who asked for unemployment related benefits, and usually weakens the Pound if it posts a higher number than expected. Friday UK banks will be closed in observance of Good Friday and this will probably trigger irregular movement on Pound pairs. 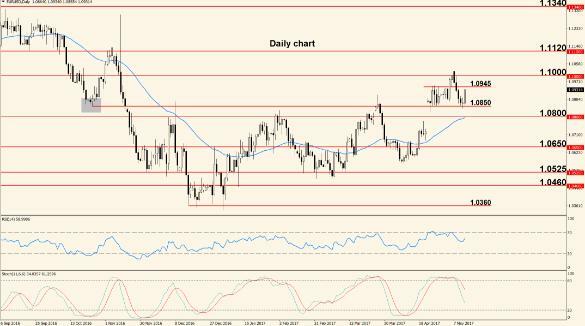 WEEKLY ANALYSIS: U.S. PRESIDENT TRUMP SAYS DOLLAR IS ‘TOO STRONG’. DO THE MARKETS AGREE? 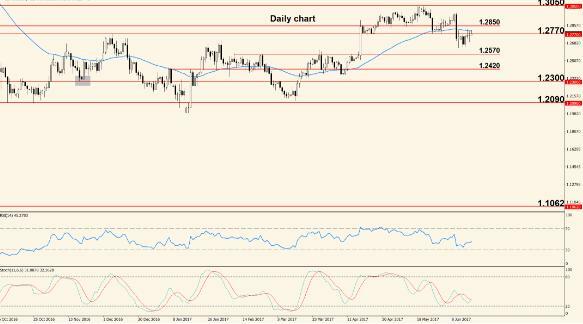 Weekly Analysis: The pair climbed last week, following a comment made by U.S. President Trump regarding a “too strong” US Dollar but most of the rise was erased a day after and the week ended with price close to the opening point. It is clear now that price reacts to the resistance at 1.0680, as seen from last week’s bounce, but it must be noted that the sellers couldn’t take the pair below 1.0600 so there is not enough traction on either side. The beginning of this week will be affected by the Easter holidays and we will most likely see alternating periods of low and high volatility but strictly from a technical point of view, our bias is bearish as long as the pair remains below the 50 period Exponential Moving Average and below 1.0680 resistance. Monday most European banks will be closed, celebrating Easter Monday and no major economic indicators will come out. Volatility will most likely be affected and price may move erratically, so caution is recommended. Tuesday the US Dollar will be affected by the release of the Building Permits, but the indicator lately has just a low-to-medium impact; Wednesday we take a look at European inflation with the release of the Final version of the Eurozone Consumer Price Index. Thursday lacks major releases and the week ends Friday with the German Services and Manufacturing PMIs as well as the U.S. Existing Home Sales. Overall we have a rather slow week ahead of us, without high impact market movers, so the main factor for direction will be the technical aspect. 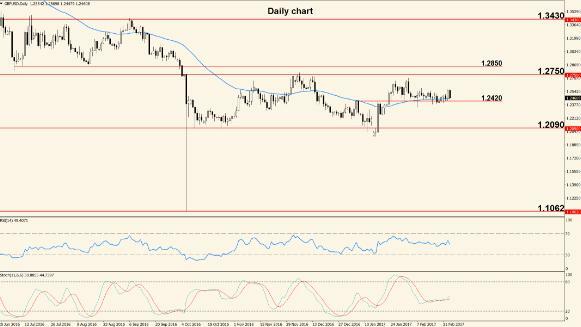 Last week was mostly controlled by the bulls but the resistance located at 1.2570 stopped the pair’s rise once again. Price remains in a range, without clear control from either side. The rally was hindered by 1.2570 resistance but the short term momentum belongs to the bulls, so it’s very probable that we will soon see a break of the mentioned level. Until the pair moves outside the channel created by 1.2570 or and 1.2420, we expect to see choppy movement, characteristic to range-bound trading. For the time being, our bias is mostly neutral for this pair but given the US Dollar weakness seen last week, we anticipate a break of 1.2570 resistance. UK banks will be closed Monday in observance of Easter and the week remains slow until Thursday when Bank of England Governor Mark Carney will deliver two speeches in Washington, one at the Institute of International Finance Policy Summit and the other at a Bank of France event. Friday the British Retail Sales are released, showing changes in the total value of sales made through retail outlets; this is usually a high impact indicator, which strengthens the currency if it posts numbers above expectations. Last edited by GDMFX; 17-04-2017 at 14:09. Weekly Analysis: Last week the bulls scored an important victory by moving the pair above the 50 days Exponential Moving Average but some of the gains were erased later in the week. 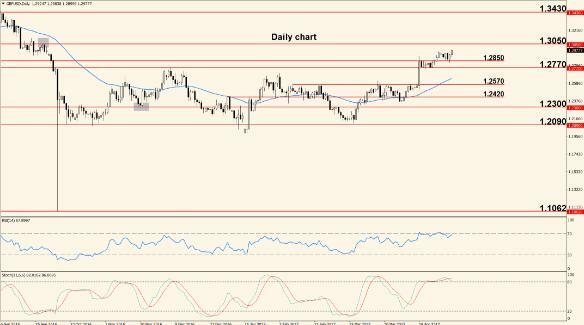 Overall, price action was bullish, but key resistance (1.0800) was not broken. Price is capped to the upside by the resistance at 1.0800 and to the downside by the 50 days EMA as well as several support levels. The last two days show candles with wicks in their upper and lower sides respectively, which is a sign of indecision but the focus early in the week will be on the French Presidential Election, which will generate increased volatility and possibly a strong move in one direction. For this reason, we recommend caution, especially during the first part of the week. The first important release of the week is the German IFO Business Climate, scheduled Monday. This is a survey of about 7,000 businesses, derived from their opinions on current and future economic conditions. Also keep in mind that the French Presidential Election held on Sunday will probably have a strong impact on the Euro in the beginning of the week. 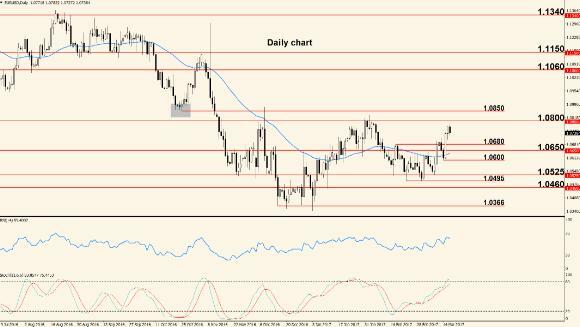 Tuesday the focus shifts towards the US Dollar for the release of the U.S. Consumer Confidence survey and Wednesday is a slow day, without any major economic releases. 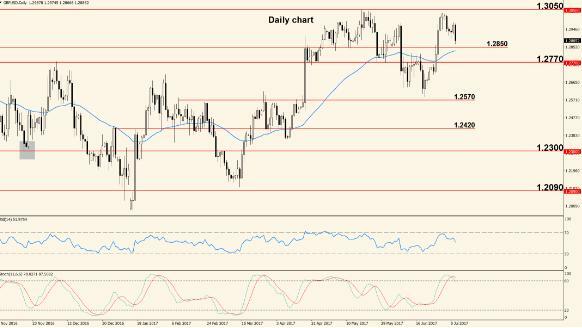 Thursday will be the most important day of the week for the Euro as the European Central Bank meets to announce the interest rate. Soon after the announcement, ECB President Mario Draghi will hold a press conference, discussing the rate decision and answering journalists’ questions. Usually the conference creates strong volatility and possibly irregular price action. The trading week finishes Friday with a potential market-mover for the US Dollar: the U.S. Advance version of the Gross Domestic Product. Out of the three versions of the GDP (Advance, Preliminary and Final), this is the earliest and tends to have the strongest impact. British Prime Minister May called for a snap General Election that will take place in June and this was the highlight of last week, triggering a huge move to the upside that took the pair above the long time resistance at 1.2770. After breaking the top of the channel that confined the pair for a long time, price stopped between 1.2850 and 1.2770 and remained there for the rest of last week. The bias is now bullish but it must be noted that the Relative Strength Index and Stochastic have both reached overbought and this is an early sign that a bearish pullback will soon occur. The French Presidential will have an impact on the markets and this pair will probably be affected as well, thus we recommend caution, especially early in the week. The Pound has a very slow week ahead in terms of economic indicator releases. The only major indicator is the British Preliminary Gross Domestic Product, scheduled Friday. This is the main gauge of an economy’s performance and usually strengthens the currency if it posts higher than expected numbers. Weekly Analysis: After the gap seen a week before, the pair started to move almost sideways and both bulls and bears seem to have lost interest. Part of this slow directional movement can be attributed to the lack of major releases last week. 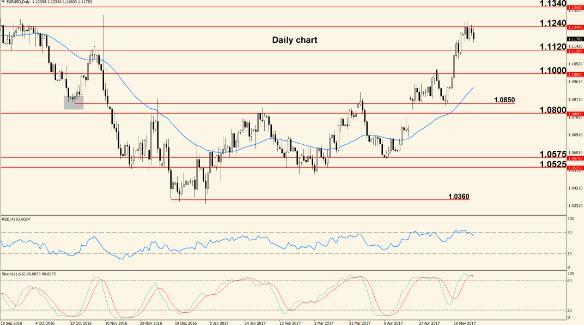 After breaking 1.0850 the pair established resistance around 1.0945 and remained between the two levels for the entire week. Now the Relative Strength Index and the Stochastic are both overbought, which is usually an early indication that price may be coming down in the near future. The weekly gap is not closed and usually price returns to where the gap originated, so we may see an extended move down but this is not a certainty; also, the time it takes for the gap to close is unknown. For now the levels to watch are 1.0945 as resistance and 1.0850 as support; a break of either one may trigger an extended move in that direction. Monday most banks across Europe will be closed, celebrating Labor Day and this is likely to generate irregular volatility and choppy price action, so caution is advised. On the US Dollar side we have the Manufacturing PMI, which is a survey derived from the opinions of purchasing managers regarding business and economic conditions. Tuesday is a slow day but action picks up Wednesday when the Fed will announce the interest rate (no change expected from the current <1.00%) and the will release the FOMC Statement, which contains details about the reasons that influenced the rate decision. Thursday we have another slow day, without major releases and the trading week finishes Friday with the always important Non-Farm Payrolls, an indicator that tracks changes in the number of employed people, excluding the farming industry. The pair continued last week the bullish momentum started when British Prime Minister May called for a snap general election, and exited the horizontal channel that confined it for more than a week. Although the pair paused and moved sideways for more than a week, we didn’t see a clear retracement to the downside and such a move is due, considering the overbought condition of the Relative Strength Index and Stochastic. 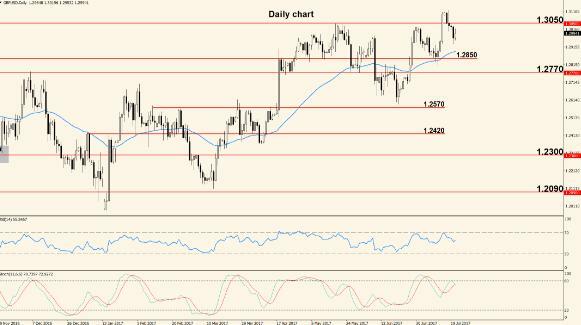 The current up move may extend into the resistance at 1.3050 but once and if it gets there, we expect a bounce lower. Also keep in mind that 1.3000 is a big round number and price will probably react to it as well. Monday UK banks will be closed in observance of May Day and the rest of the week the Pound will be affected by the release of three Purchasing Managers’ Indexes: Tuesday the Manufacturing PMI comes out, followed Wednesday by the Construction PMI and Thursday by the Services PMI. These are surveys of purchasing managers from the respective sectors, which act as leading indicators of economic health but usually the impact is low-to-medium; however, numbers above expectations tend to strengthen the Pound. Of course, the pair will be directly affected by the U.S. indicators released throughout the week. Weekly Analysis: Last week the Fed decided to keep the rate unchanged as expected, they didn’t give strong hints about a June hike. The employment data released Friday was better than anticipated but the previous number was revised lower and overall the US Dollar weakened, allowing the pair to climb. The previous week ended with price right on the psychological level at 1.1000. Usually the market reacts to big, round numbers and the Relative Strength Index is very close to overbought, so all this increases bearish pressure and might generate a move lower in the form of a pullback. However, it must be noted that the pair is in an uptrend, which was just renewed by the break of the previous high at 1.0945. If the psychological resistance at 1.1000 is broken easily, we expect the upside to prevail and the pair to move towards the next resistance, located at 1.1120. Monday French banks will be closed in observance of Victory Day but the rest of Europe will do business as usual. The most important release of the day will be the German Factory Orders, an indicator that shows changes in the value of purchase orders placed with manufacturers. Keep in mind that Sunday the second round of the French Presidential Election takes place and we expect price action to be heavily affected throughout the beginning of the week. Tuesday and Wednesday there are no notable releases on the schedule but action picks up a little Thursday with the U.S. Producer Price Index, an indicator that tracks changes in the price charged by producers for their goods. It has inflationary implications because a higher producer price ultimately leads to a higher consumer price, but the impact is not always notable. Friday is a busy day for the US Dollar, with three important releases: the U.S. Consumer Price Index (a key gauge of inflation), the Retail Sales and the University of Michigan Consumer Sentiment, a survey that shows the opinions of about 500 consumers regarding economic and business conditions. Also Friday the G7 Meetings start, attended by central bankers from the 7 member states. 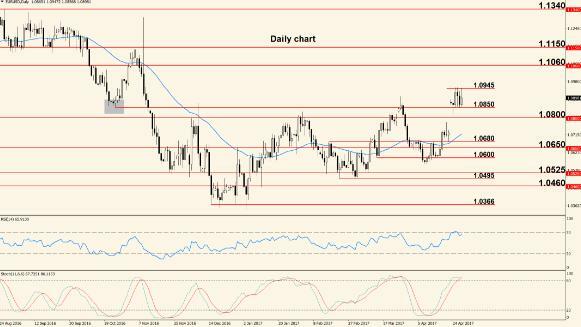 Most of last week’s price action was ranging, with the pair trading closely above 1.2850. The strongest movement was seen Friday, on the back of U.S. employment data. The previous resistance at 1.2850 was tested from above and price bounced higher, thus we can now consider this level support. The pair is making higher highs and higher lows, indicating that it is currently in an uptrend, so we expect to see a touch of the next level of importance, located at 1.3050; 1.3000 is also important because it is a big, round number. The pair is likely to retrace lower when one of these levels is touched, but after said retracement, the uptrend will probably continue if key support is not broken. The Pound has a lackluster week ahead, except for Thursday when the Bank of England will release their Inflation Report but will also announce the Official Bank Rate, the rate votes of the MPC members and the Monetary Policy Summary, outlining the reasons behind the votes. There’s no change expected for the rate (currently 0.25%) but this cluster of events is likely to trigger increased volatility. UK representatives will attend the G7 Meetings that start Friday. WEEKLY ANALYSIS: UPTRENDS LOSE MOMENTUM. 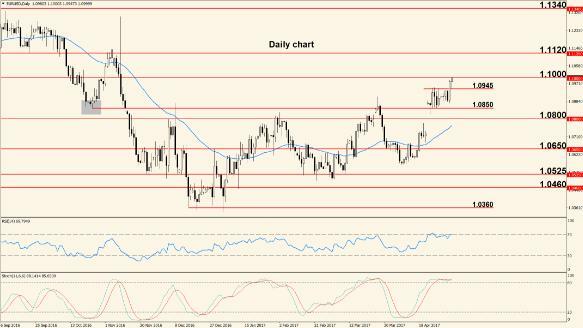 US DOLLAR BACK ON TRACK? Weekly Analysis: Last week started strong for the bears, who managed to take the pair into 1.0850 support but most of the US Dollar gains were erased Friday on the back of disappointing U.S. data and rumors that the ECB may start to taper its quantitative easing. This week we will probably see another test of 1.1000 zone, as current momentum seems to belong to the bulls. If this resistance area can be surpassed, the next destination will become 1.1100 – 1.1120 but we have a slow economic week ahead and this may generate ranging movement, without major advances to either side. To the south, the first notable zone of support is the confluence between 1.0800 level and the 50 days Exponential Moving Average. A break of this zone may trigger an extended move down. The first notable event of the week is the release of the Eurozone Flash version of the Gross Domestic Product, scheduled Tuesday and followed later in the day by the U.S. Building Permits. Wednesday we take a look at Eurozone inflation with the release of the Final version of the Consumer Price Index, which although is the least important of the three versions, can still generate strong movement. Thursday we take a look at the U.S. Unemployment Claims, showing the number of people who asked for unemployment benefits during the previous week, but because this is a weekly indicator, it tends to have a low-to-medium impact. Friday is yet another slow day, without major economic releases, similar to the rest of the week. 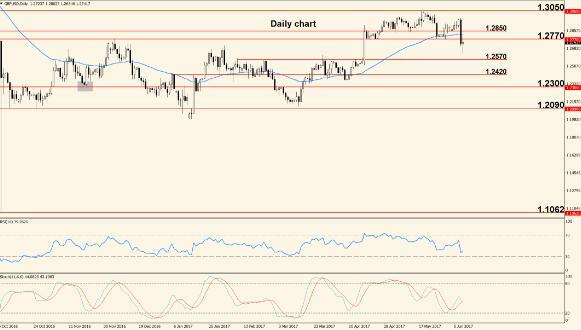 Price action was choppy last week, with a bearish bias that took the pair into the support at 1.2850. The Bank of England kept the rate unchanged and did not signal a hike in the near future. The move up started in March is overextended and in need of a deeper retracement. If 1.2850 support can be broken early in the week, we expect a quick move into 1.2770 and possibly into the 50 days Exponential Moving Average but it must be noted that an uptrend is in place as long as the pair is trading above 1.2770 and the Moving Average. The first major upper barrier is represented by the level at 1.3050. The Pound will be affected by three important releases this week: Tuesday the British Consumer Price Index comes out, showing changes in the price that consumers pay for the goods and services they purchase. The indicator acts as the main inflation gauge and usually has a strong impact on the Pound. Wednesday’s highlight is the Average Earnings Index, an indicator that shows changes in the price that businesses pay for labor and the last release of the week is the British Retail Sales, scheduled Thursday. Overall, we have a rather slow fundamental week all around but this doesn’t necessarily mean that volatility will be low. WEEKLY ANALYSIS: WHAT GOES UP MUST COME DOWN. IS THE BULL-RUN CLOSE TO AN END? 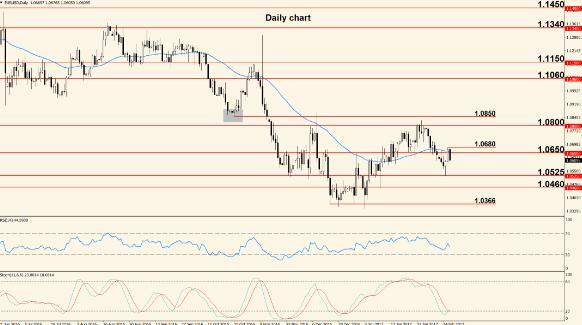 Weekly Analysis: The pair showed massive bullish movement last week, broke several resistance levels and climbed for approximately 280 pips. US Dollar weakness seen across the board was the main catalyst behind the move. The immediate destination seems to be the resistance at 1.1240, where we expect to see a bounce lower, forming a retracement. However, we don’t expect this pullback to go below 1.1120 – 1.1100 and once support has been established, the chances of another push to the north will increase. 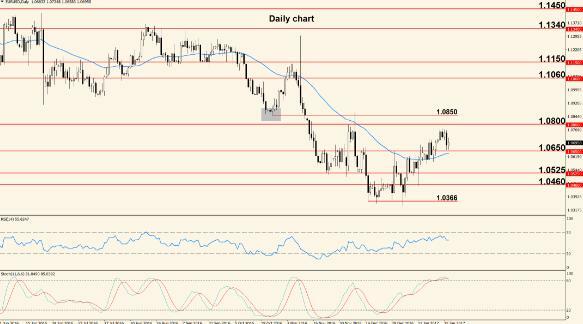 If 1.1240 is broken, the next resistance is located 100 pips higher, at 1.1340. To the downside 1.1120 is the first support, followed by 1.1000 but currently the pair is in a clear uptrend so we favor the upside. The pair has a slow start of the week, with the Eurogroup Meetings being Monday’s only notable event. Action picks up a bit Tuesday with the release of the German IFO Business Climate, a survey derived from a very large sample of about 7,000 businesses and focused on the respondents’ opinions on current business conditions as well as a 6-month outlook. On the US Dollar side we have the U.S. New Home Sales numbers, released later in the day. Wednesday ECB President Mario Draghi will speak in Madrid at the First Conference on Financial Stability, organized by the Bank of Spain. Later that day the FOMC will release the Meeting Minutes, containing details of their last interest rate vote but also, possible hints about future rate hikes. Thursday French and German banks will be closed in observance of Ascension Day and the trading week ends Friday with the U.S. Preliminary Gross Domestic Product, which is an economy’s main gauge of performance and an always-important indicator that can strongly affect the currency. 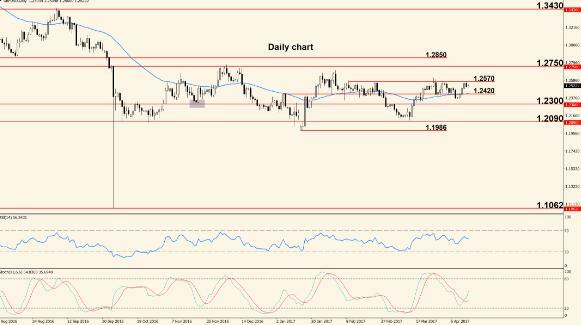 The pair traded higher last week and climbed into 1.3050 resistance after a bounce off of 1.2850 support. 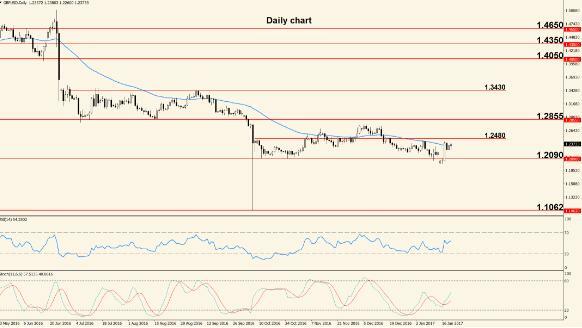 The Pound benefited from positive economic data but also the US Dollar weakened against most of its counterparts and these facts combined generated the push into resistance. 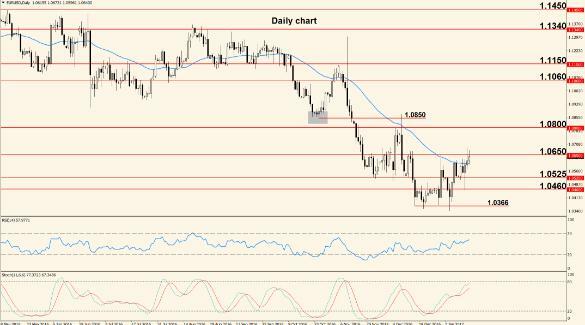 The first touch of 1.3050 triggered a fast bounce lower, which seemed to have 1.2850 as target; however, all the Pound losses were erased the next day and now the pair is testing 1.3050 again. 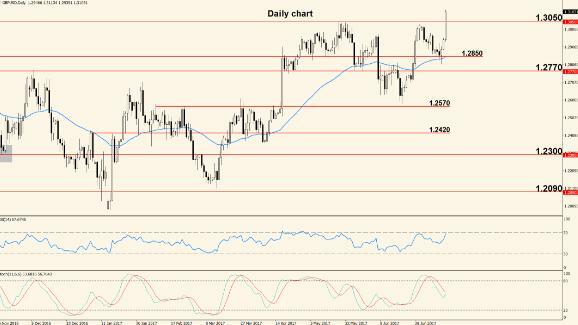 A break of this important level would score another victory for the bulls and would open the door for a move into 1.3430. Keep in mind that we are talking about almost 400 pips so even if the target is reached, it probably won’t happen in a week unless surprising events take place. To the downside, 1.2850 is the first support, followed by 1.2770 and the 50 days EMA. The Pound will only be affected by two major events this week. The first is the Inflation Report Hearing, scheduled Tuesday, when Bank of England Governor Mark Carney will testify on economic situation and inflation before the Parliament's Treasury Committee. The other event is the release of the British Second Estimate version of the Gross Domestic Product, scheduled Thursday. Weekly Analysis: For the entire last week the pair consolidated below 1.1240 resistance and the bull run came to a halt, preparing the stage for a deeper move south. The economic scene didn’t present any market moving events and this contributed to the overall situation. Several Daily candles pierced 1.1240 resistance but failed to close above it, thus showing clear signs of rejection and making us anticipate a move lower, which will have 1.1120 – 1.1100 as first target. Despite the failure at 1.1240, it must be noted that the pair is still in an uptrend a significant low hasn’t formed yet. This means that a potential break of 1.1240 will probably take the pair into the next resistance, located at 1.1340. Monday ECB President Mario Draghi will testify about the economy before the Economic and Monetary Affairs Committee. This is potentially a big mover for the Euro and will probably generate increased volatility. U.S. Banks will be closed, in observance of Memorial Day. Tuesday the German Preliminary Consumer Price Index will be the highlight on the Euro side, while the US Dollar will be affected by the Consumer Confidence, a survey that acts as a leading indicator of consumer spending. Wednesday we take a look at European inflation with the release of the Flash Estimate version of the Consumer Price Index and Thursday U.S. jobs data is released in the form of the ADP Non-Farm Employment Change, a report that shows changes in the number of employed people, excluding the farming sector and Government. The week ends Friday with the most important U.S. jobs report: the Non-Farm Payrolls. Similar to the previous indicator, this one shows changes in the total number of employed people, excluding the farming sector but including Government jobs. Usually a number above expectations shows increased economic activity and strengthens the US Dollar. The Pound took a hit last week, dropping for more than 250 pips. Brexit concerns, including the approaching of the June 8 election and the ability of British Prime Minister May’s party to win that election, seem to be the main reason behind the drop. 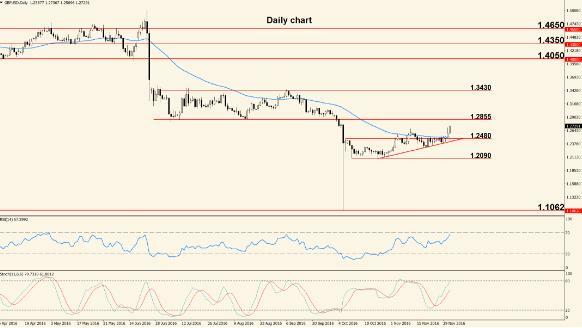 After failing to break 1.3050 key resistance, the pair dropped into the 50 days Exponential Moving Average and into the support at 1.2770. The way price behaves here will be very important for medium term direction because we are dealing with a confluence zone (two or more technical elements meet in the same place or close vicinity) and a break would show increased bearish pressure, making 1.2570 – 1.2550 the next destination. To the upside, 1.3050 remains the main resistance but a move into this level would have to be backed by strong fundamentals. The Pound has a slow week ahead, which starts with the Spring Bank Holiday on Monday. No high-impact indicators will be released until Thursday when the Manufacturing PMI comes out, followed Friday by the Construction PMI. Both are surveys of purchasing managers from the respective sectors and act as leading indicators of optimism and economic health. Higher numbers usually strengthen the Pound but the impact is not always high if the actual number comes close to the forecast. Weekly Analysis: Last week the bulls maintained control and managed to push the pair above 1.1240 resistance, helped also by a much worse than expected Non-Farm Payrolls reading. 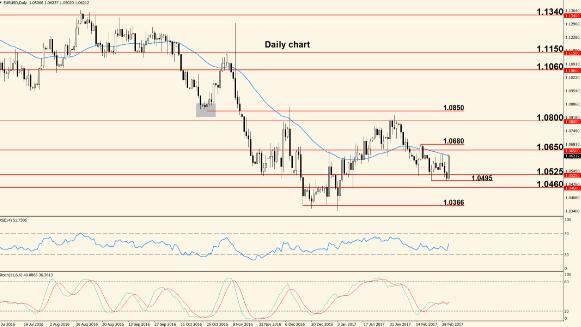 After a retracement and a perfect bounce at 1.1120, the pair moved back into 1.1240 resistance and this time the level was broken decisively. 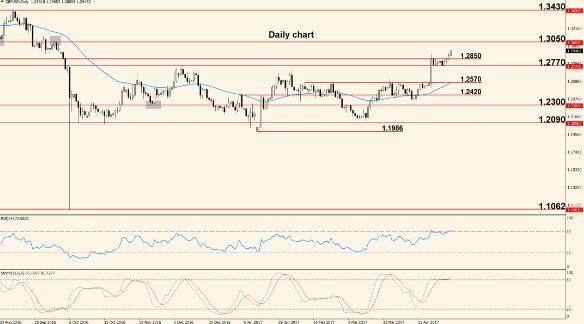 This means that the uptrend has resumed and price is on its way to the next resistance, located at 1.1340 – 1.1350. It must be noted that the Relative Strength Index and Stochastic have spent a lot of time in the upper part of their channels and although this is normal during an uptrend, it can also mean that a deeper pullback may soon follow. 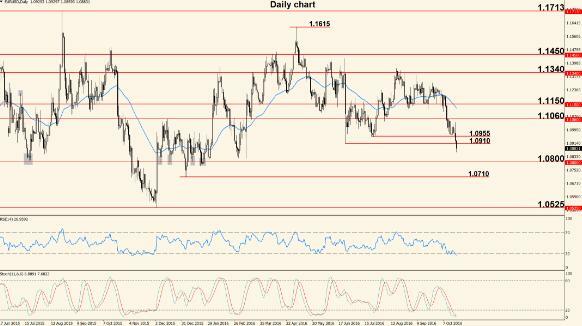 If price moves below 1.1240, it will encounter strong support at 1.1120. French and German banks will be closed Monday in observance of Whit Monday, and this will probably affect volatility, generating choppy price action. On the US Dollar side we have the ISM Non-Manufacturing PMI, a survey of purchasing managers from outside the manufacturing sector, which acts as a leading indicator of economic health and optimism. Tuesday and Wednesday are slow days for both currencies but action picks up Thursday when the ECB will announce their decision on where to set the interest rate and ECB President Draghi will hold the usual press conference, discussing the rate decision and answering journalists’ questions. Usually volatility surges during the press conference, especially if Draghi offers hints about future rate changes. The trading week will end with another day that lacks major releases on either side. The pair had a very choppy week but it showed that for the time being the US Dollar is not strong enough to break horizontal support or the 50 days Exponential Moving Average. 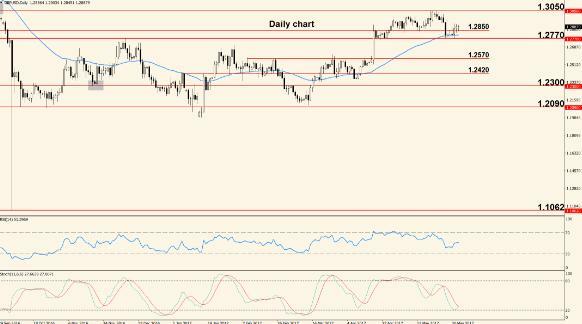 The week lacked major economic releases and this contributed to the choppy action. Most of last week’s daily candles are small and with large wicks, which is a sign of indecision from both sellers and buyers. For the time being the 50 days Exponential Moving Average and the support at 1.2770 are holding, also the US Dollar was weakened by disappointing Non-Farm Employment numbers and all this suggests that the pair will climb towards 1.3050. However, it must be noted that this week the British Parliamentary Elections will take place and this will heavily affect the Pound, so the technical aspect will be secondary. The first event of the week is the release of the British Services PMI, scheduled Monday; usually this survey creates volatility only if the actual reading differs from expectations. Probably the biggest movement on Pound pairs will be seen Thursday when the UK Parliamentary Elections take place. Caution is recommended throughout the day. Friday the British Manufacturing Production is released, showing changes in the total value of goods generated by the manufacturing sector. Higher numbers usually strengthen the Pound but same as with the Services PMI, the impact is bigger if the actual reading differs from expectations. Weekly Analysis: Last week the ECB announced they’ve reduced inflation expectations for 2017 and the years to follow. This was the main reason for a drop seen Thursday but other than that, price action was choppy and without clear direction. 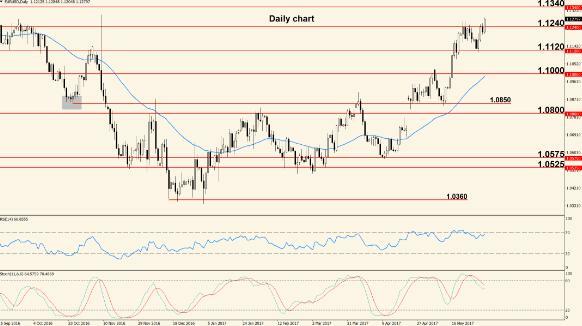 The pair retraced after reaching a high at 1.1283 and moved below 1.1240, showing increased bearish pressure. The Relative Strength Index reached its 70 level several times during the last period, becoming overbought and showing bearish divergence (price is making higher highs while the oscillator is making lower highs). These facts, combined with the ECB stance on inflation, make us believe that the pair is headed lower, possibly into the 50 days Exponential Moving Average. The first hurdle is the support at 1.1120 but if price bounces higher from there, we may see another encounter with 1.1240. The week starts slow, without any major indicators released on Monday but Tuesday action picks up with the release of the German ZEW Economic Sentiment and U.S. Producer Price Index. Both releases have the capacity to move the currencies strongly, but the impact is lower if the actual number matches expectations. Wednesday will be a big day for the US Dollar because 3 major releases are scheduled: the U.S. CPI (key inflation gauge), the U.S. Retail Sales and the Fed will announce the interest rate which is expected to increase to <1.25% from the current <1.00%. All this is likely to generate increased movement on all US Dollar pairs, so caution is recommended. Thursday is a slow day for both the US Dollar and Euro and the trading week ends Friday with the release of the European Final Consumer Price Index and the University of Michigan Consumer Sentiment, which is a survey that tries to gauge the confidence of consumers in economic conditions. The British Parliamentary Elections resulted in a hung Parliament, meaning that the Conservative Party won but didn’t manage to take enough seats to establish a majority. 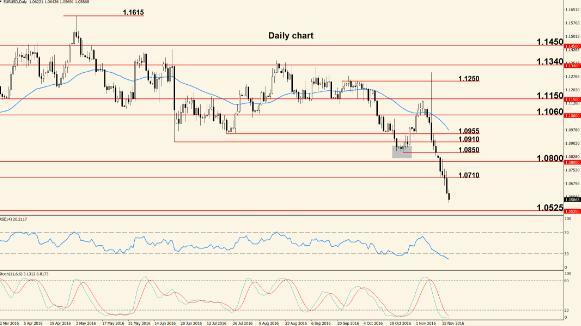 This triggered a sharp drop for the Pound and a break of several support levels. 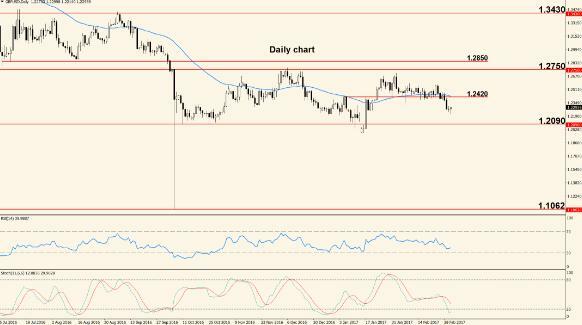 Given the current political situation in the United Kingdom, the Pound is likely to continue to weaken and to head into the next support located at 1.2570. The pair is now trading below two important levels (1.2850 and 1.2770) and below the 50 days Exponential Moving Average so the bias is bearish from a technical standpoint as well as fundamental. However, this is still a high-risk pair and we recommend caution trading it. The first important release for the Pound is the British Consumer Price Index, scheduled Tuesday. The indicator is the main gauge of inflation and shows changes in the price that consumers pay for the goods and services they purchase. Wednesday’s highlight is the release of the Average Earnings Index, an indicator that shows changes in the price paid for labor by businesses and Government. The last major event of the week for the Pound is the announcement of the BOE interest rate, along with a Monetary Policy Summary, scheduled Thursday. As always, the U.S. events will have a direct and possibly strong influence on the pair’s direction. Weekly Analysis: Last week’s main story was the Fed rate hike from <1.00% to <1.25% but also the hawkish Fed press conference. 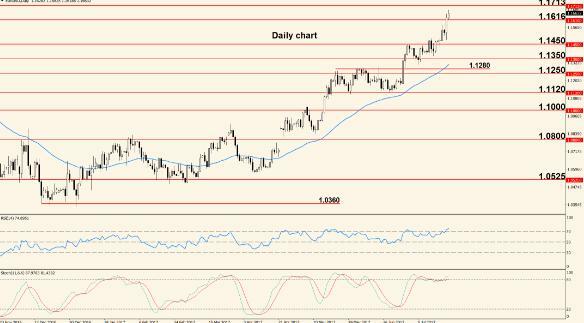 The positive vibe that surrounded the US Dollar reversed an earlier climb towards 1.1300 and brought the pair into 1.1100 territory. 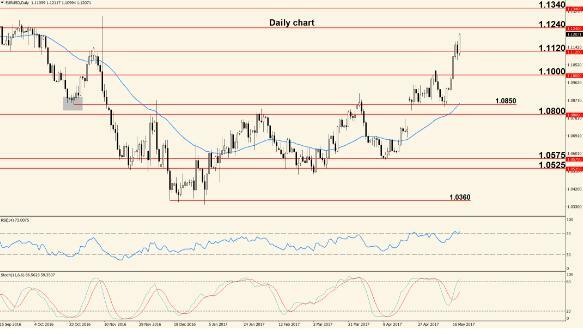 After reaching a weekly high at 1.1295 the pair dropped close to 1.1120 support and now the greenback is benefiting from a positive market sentiment. We expect to see an encounter with 1.1120 and the 50 days Exponential Moving Average early in the week but the pair is still in an uptrend, so once the 50 EMA is reached, we may see another push to the north. However, as long as last week’s high is not broken, our bias is bearish, aiming for a move into 1.1000 territory. The week ahead is surprisingly slow in terms of economic releases for both currencies in the pair. Monday and Tuesday we don’t have anything major on the economic calendar, while Wednesday’s only notable release is the U.S. Existing Home Sales. A higher than anticipated reading shows a healthy house market and this usually strengthens the US Dollar. Thursday the focus shifts on the Euro for the release of the Eurozone Consumer Confidence, a survey that gauges the opinions of about 2,300 European citizens regarding economic conditions. Friday the center stage is taken by Purchasing Managers’ Indexes, namely the German Services and Manufacturing PMIs as well as the Eurozone Services and Manufacturing PMIs. On the US Dollar side we have the New Home Sales, an indicator that shows the annualized number of houses sold during the previous month. The pair has just completed a very choppy week, with price bouncing all over the place, especially in the later part of the week. The Bank of England has kept the rate unchanged but 3 out of the 8 MPC Members voted for an increase and this generated Pound strength. The last three Daily candles are showing long wicks and rejection at the 50 period Exponential Moving Average. This is a sign of indecision and lack of determination from both sides; the bulls cannot break the 50 EMA and the bears cannot take price lower. Due to these factors, our outlook is mostly neutral until a clear direction is established. However, it must be noted that the 50 period EMA and the level at 1.2770 form together a confluence zone of resistance, which may push price lower during the early stages of the week. The Pound has an even slower fundamental week than the Euro and US Dollar, and the only notable indicator is the Public Sector Net Borrowing, scheduled Wednesday. The indicator shows the difference between spending and income for the Public Sector and a figure above zero indicates deficit, while a figure below zero shows excess. Lower numbers for this indicators are usually beneficial for the currency but the impact is often limited. Weekly Analysis: Last week the bears attempted to break support but the US Dollar strength faded and the pair started to move north, erasing almost all the losses incurred earlier in the week. Overall we had a neutral week, with price finishing close to where it started. 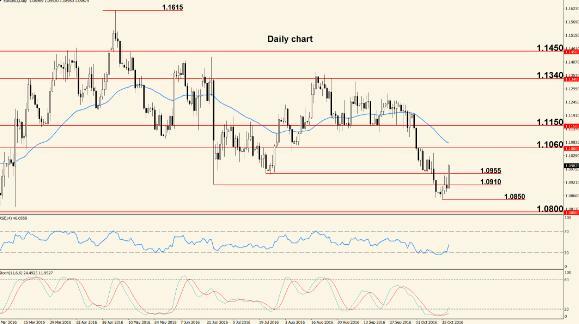 After a perfect touch of 1.1120 support, the pair bounced higher and erased the entire drop. This is the second time that 1.1120 clearly rejects falling prices and the pair is still trading above the 50 days Exponential Moving Average, so the bias remains bullish, anticipating a touch of 1.1240 and possibly 1.1280. If price drops lower, it will encounter a strong support zone because the 50 EMA is climbing and together with 1.1120 will create a confluence zone. As long as the pair is trading above horizontal support and above the 50 days EMA, our outlook is bullish. The week starts with the release of the German IFO Business Climate survey and the U.S. Durable Goods Orders, both scheduled Monday. These indicators are considered high-impact but lately their influence on the respective currency has diminished and a strong impact can only be seen if the actual number differs significantly from expectations. Tuesday ECB President Draghi will deliver a speech in Portugal, at the European Central Bank Forum on Central Banking and later in the day, Fed Chair Janet Yellen will speak in London about the global economy, at the British Academy 'President's Lecture'. Wednesday ECB President Draghi will participate in a panel discussion at the European Central Bank Forum on Central Banking, in Portugal. Thursday we take a look at German inflation with the release of the Preliminary Consumer Price Index, and on the US Dollar side we have the Final version of the U.S. Gross Domestic Product. The Final version is the least important out of the three (Advance, preliminary and Final), but its impact shouldn’t be overlooked. Friday no high-impact indicators will be released but worth noting are the German Retail Sales, and Chicago Purchasing Managers’ Index, both with a medium impact on their respective currencies. The Pound had an interesting week, first weakening when BOE Governor mentioned that a rate hike is not likely to come very soon, and then erasing some of the losses on the back of hawkish comments made by a member of the Monetary Policy Committee. Although the pair climbed during the latter part of last week, the bias remains bearish as long as price is trading below 1.2770 and below the 50 days Exponential Moving Average. Early this week, we expect to see a touch of the two resistance elements just mentioned and the way price behaves there, will decide the next move. 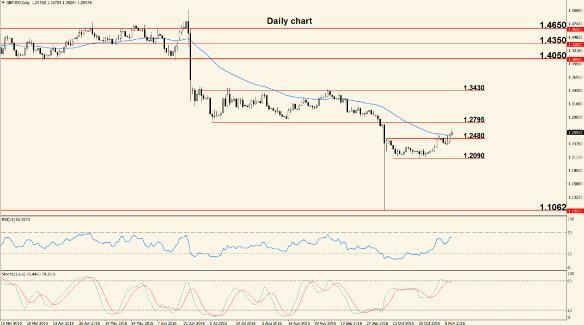 A break would show increased bullish pressure and would make 1.2850 the first target, while a bounce would probably take the pair into 1.2570 – 1.2550. Tuesday the Bank of England will release the Financial Stability Report, followed shortly by a press conference held by BOE Governor Mark Carney. This has the potential to be the biggest event this week for the Pound, so caution is recommended. Wednesday BOE Governor Carney will participate in a panel discussion at the European Central Bank Forum on Central Banking and this is another reason for possibly strong movement. The Net Lending to Individuals will be released Thursday and Friday the Current Account comes out, showing the difference in value between imports and exports. The same day the British Final GDP comes out, but this version usually has a low impact on the currency. Weekly Analysis: The Euro experienced a huge boost coming from Draghi’s hawkish comments made at the European Central Bank Forum, so the pair moved higher for the entire last week, breaking several resistance levels. The strong move seen last week has renewed the uptrend and took the pair out of the choppiness it was in. 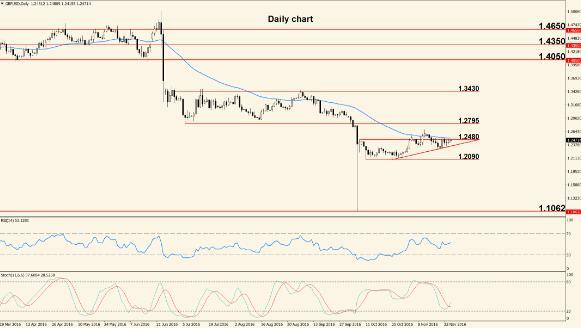 Now the picture is bullish once again and the pair is trading above several broken resistance levels, which may turn into support this week. The resistance at 1.1450 is a key level that reversed rising prices in the past and the Relative Strength Index is overbought, so we must be wary of a pullback this week. The first potential support is located at 1.1350 but keep in mind that the US Dollar will be affected by important events this week. The week starts pretty slow, with the release of the U.S. Manufacturing PMI scheduled Monday and followed Tuesday by a major Holiday: the U.S. Independence Day. American banks will be closed and volatility will be affected. Wednesday the Fed will release the FOMC Minutes of their latest Meeting, revealing the reasons that stood behind the latest rate vote and Thursday we take a first look at the U.S. jobs market with the release of the ADP Non-Farm Employment Change. Friday will probably be the busiest day of the week because the Group of 20 (G20) Meetings start and also the US Dollar will be heavily affected by the Non-Farm Payrolls, a report that is widely considered the most important U.S. jobs data. 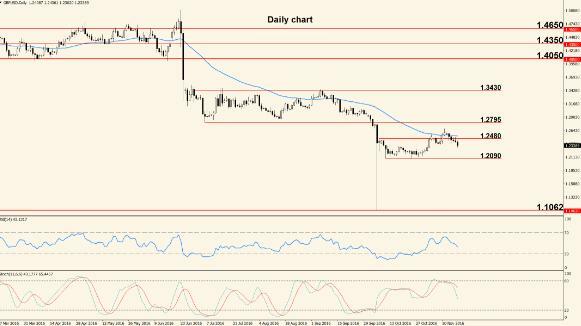 US Dollar weakness and hawkish comments made by BOE Governor Mark Carney generated a very strong week for the Pound and took the pair more than 300 pips higher. The Sterling is clearly winning the battle against the US Dollar but the pair is facing a strong resistance at 1.3050 and the Relative Strength Index is very close to overbought territory. 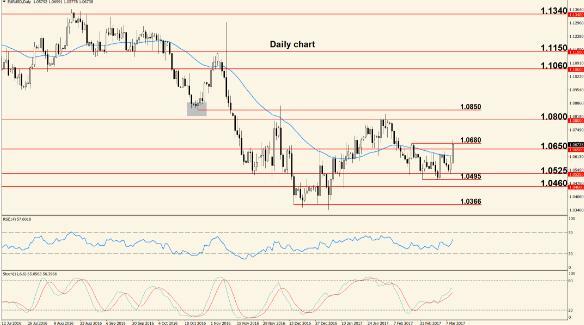 These facts make us anticipate a pullback once 1.3050 is reached; even if the level is broken, a retracement lower should soon follow. The next resistance is located at 1.3430 (observed better on a Weekly chart) but we don’t expect price to travel that entire distance this week. This week will be mainly dedicated to the British PMI series. These are surveys that try to gauge the opinions of purchasing managers from each sector regarding economic conditions and overall health of the respective sector. The Manufacturing PMI is released Monday, followed Tuesday by the Construction PMI and Wednesday by the Services PMI. British representatives will attend the G20 Meetings that start Friday so the Pound may be affected by the talks. Weekly Analysis: Last week the pair retraced lower, mostly due to overbought condition but after failing to break support, it returned to the levels seen in the beginning of the week. U.S. employment data was solid and brought the pair lower for the end of the week. 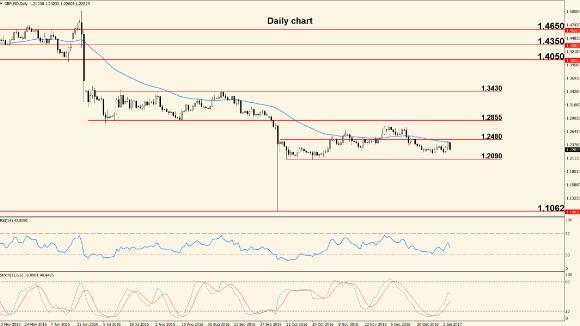 The pair is showing rejection again near 1.1450 resistance and the NFP report showed a better than anticipated reading, so its effects will be probably seen throughout this week. The pair is in a clear uptrend but for the short to medium term we expect to see a move into 1.1300 – 1.1280, mostly because the bulls failed twice to break the key resistance at 1.1450. However, if that resistance will be broken early in the week, we may see a move into 1.1500 but Fed Chair Yellen’s testimony is likely to decide the next move. The week starts slow, with the first two days lacking any major events. Action picks up Wednesday when Fed Chair Yellen will testify before the House Financial Services Committee on the topic of the Semiannual Monetary Policy Report. Thursday she will testify on the same topic but this time before the Senate Banking Committee and the same day the U.S. Producer Price Index is released. Friday the always important U.S. Consumer Price Index comes out, showing changes in the price paid by consumers for the goods and services they purchase and the final event of the week will be the U.S. Retail Sales. The Euro doesn’t have anything major on the calendar but the U.S. releases are considered high impact so we expect to see volatility throughout the week. 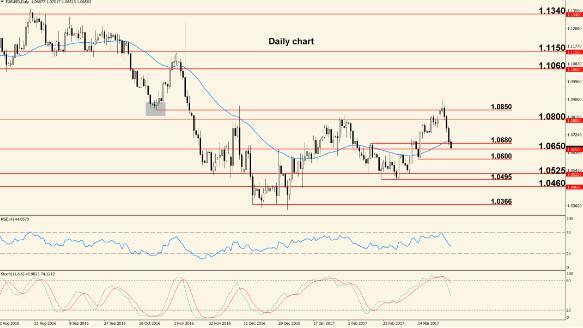 Last week belonged to the bears after another failed attempt to move above 1.3050 resistance. Later in the week, the U.S. jobs data added more strength to the greenback and now the pair is approaching support. The bullish move seen over the last weeks failed to break 1.3050 resistance and now the pair is moving south, with an overbought Stochastic and good downside momentum. The short term outlook is bearish, anticipating a touch of the support at 1.2850 and the 50 days Exponential Moving Average; if this barrier is broken, the next target will become 1.2770 but on the other hand, a break will probably generate a climb into 1.3000 area. The Sterling has a very slow economic week ahead, with the only notable indicator being the Average Earnings Index, released Wednesday. The index shows changes in the price that businesses and government pay for labor and usually has a high impact on the currency. Of course, the U.S. events will have a direct impact on the pair’s movement, as always. 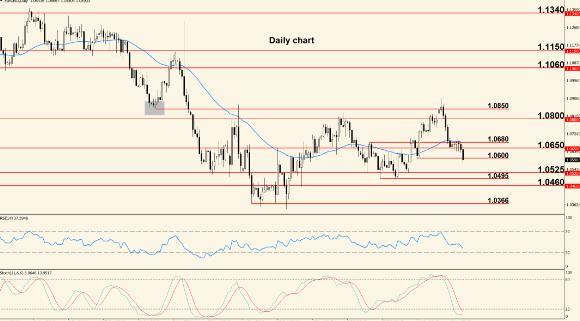 Weekly Analysis: The bulls remained in control and the pair closed last week strongly, on the back of a US Dollar sell-off triggered by weak inflation and retail sales data. However, Friday’s climb couldn’t take out the weekly top at 1.1490. 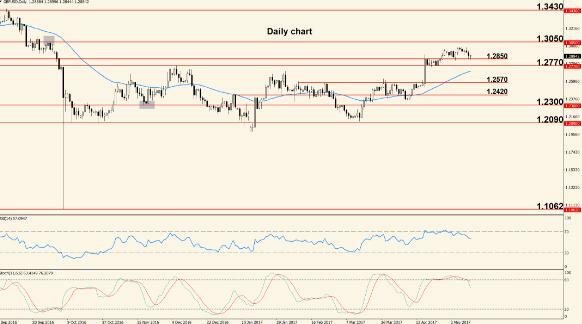 Price is now facing a cluster of resistance levels (1.1450 – 1.1490) and the uptrend is overextended, meaning that the pair travelled a long distance without a proper pullback. The Relative Strength Index first became overbought back in April and since then, it never visited the lower levels (now it is approaching overbought on a Weekly chart as well). All this makes us anticipate a retracement this week, and possibly an encounter with 1.1350, followed by the 50 days EMA. However, it is very important to note that the pair is in a strong uptrend and the RSI has been overbought for a long time and price still continued higher, so the possibility of another bullish week shouldn’t be overlooked. 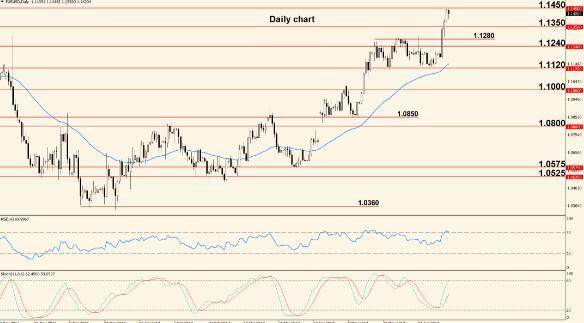 Next strong resistance is in the 1.1600 area. The first notable release of the week is the European Final version of the Consumer Price Index, scheduled Monday. Although this version is the least important out of the three, the CPI remains a high impact indicator because it’s the main gauge of inflation for the Eurozone. Tuesday the only highlight for the Euro will be the release of the German ZEW Economic Sentiment, a survey of about 275 German investors and analysts, focused on their 6-month outlook for the economy. Lately this indicator has lost some of its impact but higher numbers suggest optimism and strengthen the Euro. Wednesday is a slow day, with the only release being the U.S. Building Permits, an indicator that shows how many permits for new buildings were released during the previous month. It offers some insights into the U.S. house market but the impact is not always high. Thursday may be the most volatile day of the week as the ECB meets to announce their interest rate and ECB President Mario Draghi will hold his usual press conference. The rate is not expected to change but the press conference usually triggers strong movement, especially if Draghi will offer hints about the next hike. After a brief dip below the 50 days Exponential Moving Average, the bulls took control and finished the week more than 200 pips above the open. Most of the climb was generated by weak U.S. CPI and Retail Sales data. 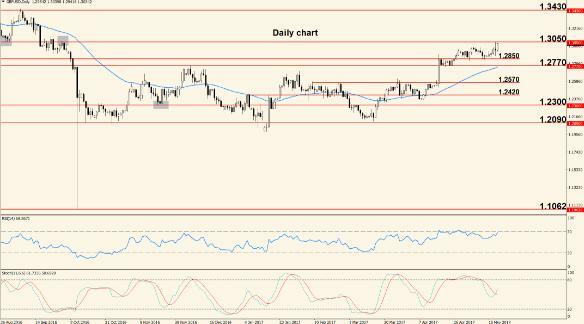 The resistance at 1.3050 was an important level and the breakout seen last week is likely to generate an extended move to the upside. 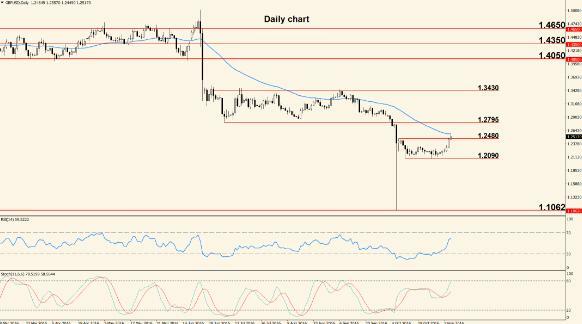 The next resistance is located around 1.3250, followed by 1.3350 and the key level at 1.3450 but price will most likely retrace lower before the first resistance is reached. It’s also very possible to see a re-test of the recently broken resistance and if this re-test is successful (price bounces at 1.3050), then the level will turn into support and the chances of an extended climb will increase. The Pound will be affected by only two important releases this week. The first is the British Consumer Price Index, which is scheduled Tuesday and the second is the Retail Sales, coming out Thursday. The CPI is the main gauge of inflation and is closely watched by the Bank of England when they decide the interest rate; on the other hand, sales made at retail levels represent the majority of consumer spending, which in turn accounts for a large part of the entire economic activity, so we can expect to see strong movement when these indicators are released. The pair posted a strongly bullish week and moved above last year’s high located at 1.1616 on the back of a hawkish Draghi press conference but also due to US Dollar heavy selling. After the break of 1.1450 resistance the bulls regained total control over the pair and broke last year’s high, threatening 1.1713, which is the highest level since August 2015. The outlook remains bullish but the Relative Strength Index has become overbought on a Daily chart and even on a Weekly chart, suggesting that a pullback will soon follow. From a short term perspective we expect a re-test of 1.1616 followed by a move into 1.1700 territory. The trading week starts Monday with a couple of medium-impact indicators for the Euro: the Eurozone Manufacturing and Services PMIs, followed the same day by the U.S. Existing Home Sales. We don’t expect substantial movement at the time of release but usually a number above expectations for any of the three indicators, strengthens the respective currency. Tuesday’s highlight will be the release of the U.S. Consumer Confidence, a survey of about 5,000 households that tries to gauge the overall opinion regarding business conditions, job availability and the economic situation in general. Wednesday will be the most important day of the week as the Fed meets to decide the interest rate, which this time is not expected to change (currently <1.25%). The FOMC will also release a statement outlining the reasons that determined the rate decision. Thursday is a slow day, with the only notable release being the U.S. Durable Goods Orders (shows changes in the total value of orders placed for goods with a life expectancy of more than 3 years). Friday we have a busier day, with the focus on the German Preliminary Consumer Price Index (main gauge of inflation) and the U.S. Advance Gross Domestic Product, which is the main gauge of overall performance of the economy. 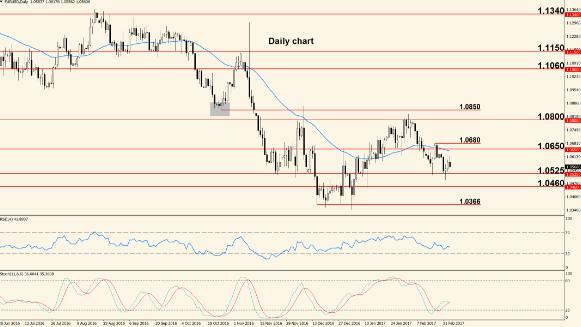 After the failed break of resistance, the Pound tumbled and the pair posted a bearish week. One of the main factors that triggered Pound weakness was the British CPI that missed the market consensus and came out below expectations. The pair is still in a choppy uptrend but the bulls are running out of steam and bearish pressure is mounting. This is shown by the failed break of 1.3050 resistance and the long-wicked candle that followed (price tried once more to move above resistance but failed). These facts make us anticipate a move into the 50 days Exponential Moving Average early in the week and the way price behaves there will reveal more hints about future direction. The Pound has a very slow week ahead, with the only major release being the British Preliminary Gross Domestic Product, scheduled Wednesday. There are three versions of the GDP – Preliminary, Second Estimate and Final – but the Preliminary tends to have the highest impact, mainly because it’s the first in the series. As always, the U.S. releases will have a direct impact on the pair’s direction.